* 1730: William Huffman  who's Mother was of English lineage, and Father was of German lineage, emigrated to America from Holland and settles in New Jersery. Old records also spell last name: Hoffman. * 1769 24th day of May: (son) William Huffman  is born. (Another record shows birth year as 1767.) Born in Monmounth County, New Jersey. * 1779 23rd day of December Rev. Thomas Winters is born in Harbaugh's Valley, Maryland. He becomes a minister in 1800. * 1792 Rev. Jacob Antrim is born in Berks County, PA., Passed in 1861. In 1819 he settled on a 120 acre farm in Butler County, Ohio. Rev. Jacob is a pioneer minister. (United Brethren Minister) In 1821, he marries Mary Zeller who passes in 1858. Rev. 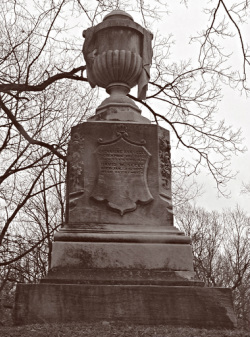 Jacob Antrim is buried in Germantown Cemetery. Mary Antrim is also buried at Germantown Cemetery. Children of Jabez and Ellen. * Ida Sarah Antrim-Zehring B: Nov. 22, 1853 Passed: Aug. 23, 1925 Buried at Germantown Cemetery. * Cyrus Antrim (Born about 1825, Passed 1891) Buried in Germantown Cemetery. Married: Lizzie (Elizabeth) B. "Unknown" B: July 16th,1840 New York P: February 21st, 1891. Buried with her husband in Germantown Cemetery, Germantown, Ohio. Mr. Antrim bred and raised race horses. At the time of his death, was a director of the Dayton Police Board. Cyrus Antrim will later marry two of the daughters of Catharine Ann Huffman-Seely and Morris Seely. First to Eliza Seely in 1851. She will pass-on nine years later in 1860. He will then marry Catharine J. Seely in 1862. * 1795 3rd day of August The only "Peace" treaty ever signed with the Indians, was signed at Fort Greene Ville, allowing the territory to be surveyed and later sold. The treaty was signed after the Battle of Fallen Timbers. The two primary signers of the treaty was General “Mad Anthony” Wayne for the US Government and Chief Little Turtle for the American Indian tribes. Included leaders of the following tribes: Wyandot, Delaware, Shawnee, Ottawa, Chippewa, Potawatomi, Miami, Wea, Kaskaskia, and Kickapoo. William Clark (of Lewis and Clark Expedition) was present at Greenville for the signing. * 1796 the 1st day of April: The settlement of Dayton was founded. The name "Ohio" originated from Iroquois word ohi-yo’, meaning "great river". Three parties left Cincinnati on March 21st to settle a new town, to be known as, Dayton. Two of groups went by land and one by water. The boat went up the Miami, dealing with many hardships but arrived at the head of what is now, St Clair Street on April 1st 1796. The other two parties came by different roads, arrived four days later, because they had bridges to build, brush to cut, making their own roads to travel. Once they arrived, their work was only just beginning, for while game was plentiful, yet crops had to be planted, shelter (homes) had to be built, all which took considerable time. Protection from bad weather and the winter to come. There were just 36 people in this colony counting men, women and children. General Wayne had signed the treaty with the Indians at Greenville, only the year previous, and there was some worry as to if the Indians carrying out their part of the treaty. * 1801 14th day of June: William Huffman  is wed to Miss Lydia Knott. Huffman section at Woodland Cemetery. In Dayton, Rev. David Winters came to know the William Huffman family through making purchases at their general store. One Sunday the Huffman family attended his service to hear him preach. Afterwards they invited him to their home for dinner. Mrs. Lydia Huffman, a devout Baptist, she and he quoted and argued scripture all evening. The next Sunday evening he was again invited for dinner. This time Mrs. Huffman said to him, “I believe you are a good man and a Godly man. I like you and so does my daughter, Mary. You may marry her.” Astonished, David Winters replied, “Mrs. Huffman, I am not in a position to marry your daughter. She has always been accustomed to plenty. I cannot keep her as you have kept her. I have nothing but my prayer book, my Bible, my horse, and a five dollar bill in my pocket.” Mrs. Huffman said to him, “That does not matter. She likes you and I like you. You marry her and I, with ample means, will see that you get a start. After that, you can pay me back when you are able.” David Winters married Mary Ann Huffman on January 11, 1826. Eventually nine children were born to them: David, Elizabeth, Mary Jane, Lydia Ann, Charles, Edward Thomas, William, Emma Virginia, and Flora. * 1803 Dayton, Ohio was Chartered. (The same year Ohio became a State. Dayton was at that time a day’s ride from Lebanon and Lebanon was a day’s ride from Cincinnati. * 1809 Reverend Thomas Winters brought his young family on flatboats to the Mad River where they built a log home and cleared a patch of land for cultivation. 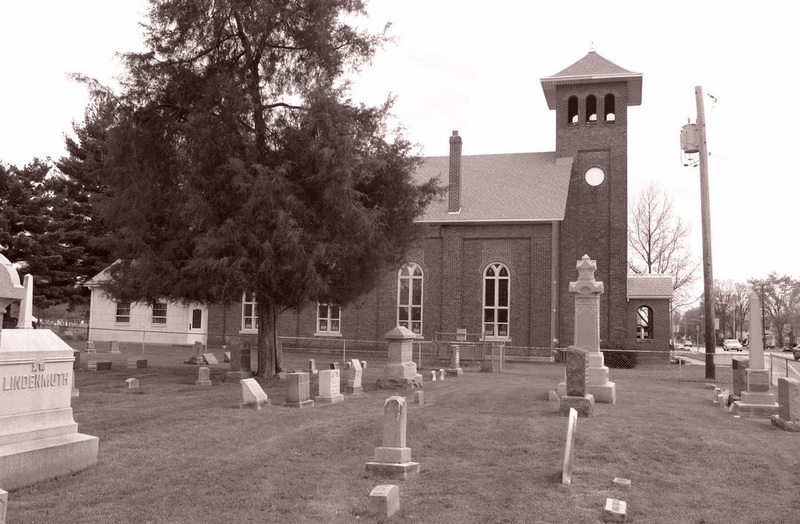 Soon he became the first minister of the Beaver German Reformed Church built in 1809 on the Dayton-Xenia Pike. By 1815 he was called to Germantown to lead the congregation of the German Reformed Church there. During his career, he traveled by horseback to the outlying settlements to preach the Word of God, baptize, marry, and bury the early Christian settlers. Before his death in 1863, he had educated five young men for the ministry, two of whom where his sons, Thomas and David Winters. Both Thomas and brother David would follow in the foot steps of their father in the service of the Lord and become preachers. Three out of four Sundays every month, Rev. Winters traveled to one of the outlying churches to preach. He also often preached in the homes of members of the congregations. He must have gotten weary at times, but he remained faithful to his flock. One of his closest friends was Christian Creager. Mr. Creager donated much of his land for the burial grounds that became David's Cemetery. It eventually became too difficult for Rev. Winters to continue preaching at all four churches he helped to form. He stayed very involved with the Zion and Mt. Zion congregations up until his death. He was still performing marriage ceremonies a month before his death. He loved not only his own congregation, but he believed in bringing different denominations together in worship. So loved and respected was Rev. Winters that Heidelberg College bestowed upon him the degree of Doctor of Divinity. He had served so many people for the 61 years in which he had preached that it was difficult for the German Reformed Church downtown to hold all those who wished to pay their respects. 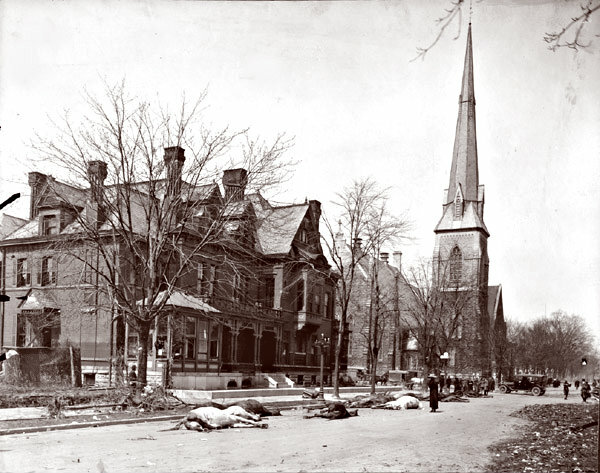 During his funeral on May 13, 1885, the church was packed, as were the sidewalks from Second St. to Third St..
* The War of 1812 with the British. * 1812 William Huffman  arrives in Dayton, Ohio from New Jersey. He came to Dayton with $10,000. He is noted for purchasing large amounts of land and building the first stone home in Dayton. (The home stood on the future site of the Beckel House. (Hotel) William Huffman's home also servered as a General Store for Mr. and Mrs. Huffman. The General Store, Mr. Huffman left largely in the care of his wife. The Huffmans were active Baptists. Many of the first services for the Baptist Church of Dayton, were held on the porch of the Huffman home. William Huffman was also fond of a good horse and said to have been an excellent horseman. Reclaimed." Followed by "Monsieur Tonsoii" fancy dance; comic song, "Bag of Nails;" to which would be added the celebrated comic farce, called, "The Village Lawyer." Tickets were fifty cents each. Doors opened at seven o'clock; curtain to rise at half-past seven precisely. Gentlemen were requested not to smoke cigars in the theater. 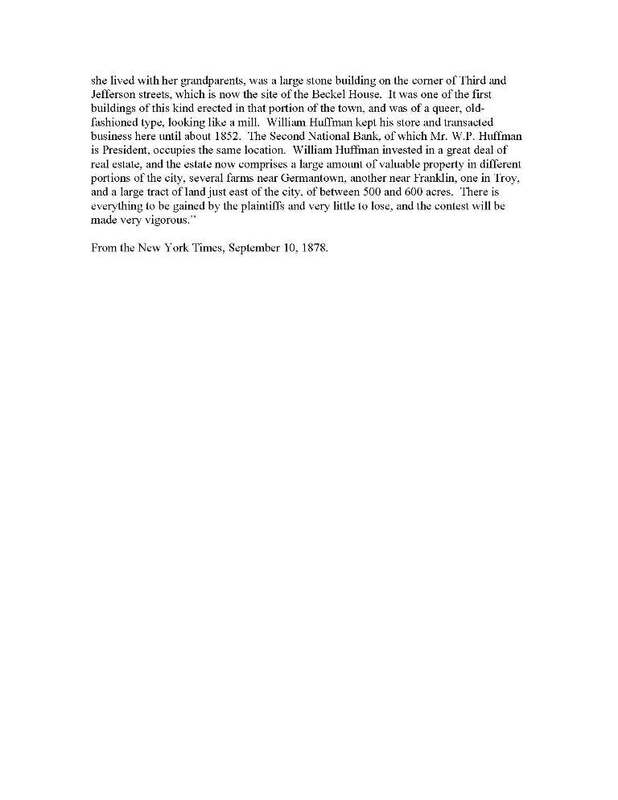 * 1813 18th day of October: William P. Huffman  is born. * 1819 the 14th day of July: One of the land deeds for purchase of land to harvest the lumber from said land. 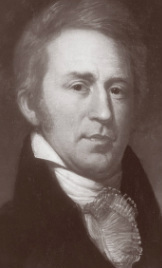 James Monroe, President. committee for the City of Dayton, Ohio. 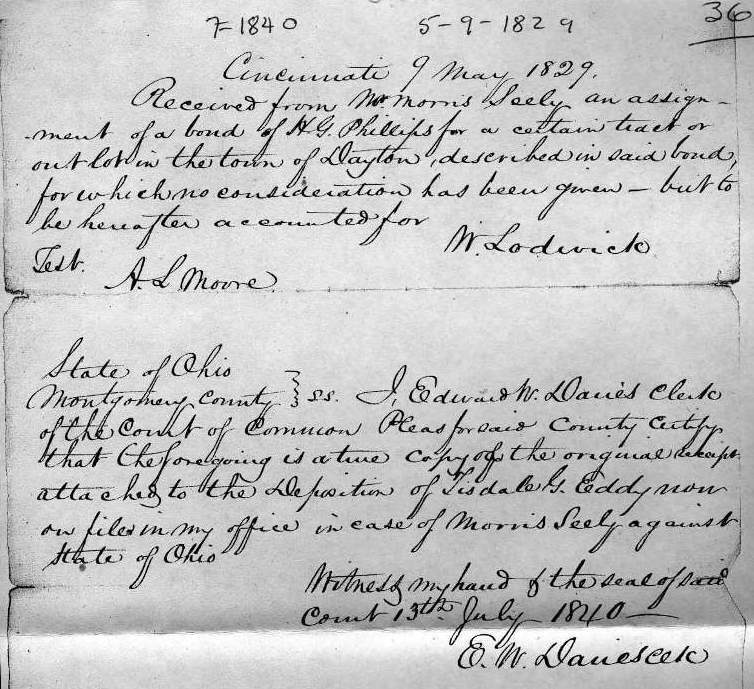 * 1823 19th day of July, Cincinnati, Ohio: Austin Seely, previously of Louisville, Kentucky, at present lumber merchant in the City of New York, appoints his brother Morris Seely of Cincinnati, blacksmith, as his attorney to deal with his affairs in Louisville, Kentucky (Jefferson County, KY) and Milton, Illinios. Signed by, Austin Seely in New York on 19th July, 1823 and by Morris Seely on 3rd of March, 1824, in Grant County. * 1824 "Mooris" Seely and Phineas T. Seely listed in the Grant County (South of Cincinnati), Kentucky Tax book. * 1824 3rd day of March: Austin Seely by his attorney Morris Seely of New York City to Phineas T. Seely of Grant County, Kentucky for $10,000 - an equal undivided half of 20,000 acres except 1200 acres sold by McElhatten to Littell, said land was patented in the name of John Phillips and John Young, now lying in Grant County....on Eagle Creek. Witness: Thomas Hubbard. Ack. in Grant County 3rd March 1824 by Morris Seely. * 1824 20th day of August: Phineas T. Seely vs. John Young, John Phillips, James Carnahan, Benjamin Lodge, John Carnahan, James McElhatten and Austin Seely. Defendants failed to appear in court. As they are not in-habitants of this state; they must appear in court by next November. Phineas marries Rebecca Jones on August 15th, 1825 in Sangamon County, Springfield, Illinois. * 1824 In New Philadelphia, Ohio, Rev. David Winters was ordained. Upon his ordination, he moved to Dayton where he organized the German Reformed Church which was to become one of the leading religious institutions of the city. Still he continued ministering to the laboring farm people in the regions outlying the city, where he would preach under the tall trees of the forest, in log huts, and barns, or in the homes where they gathered. * 1825 - 1845 Construction of the Miami Erie Canal begins. 249 miles of canal from Toledo to Cincinnati, Ohio. * 1827 Morris Seely wins the state contract to build sections 140, 141, 142 and 143 of the Miami Erie Canal, in what is now part of downtown Dayton. Little is know about Seely, prior to his coming to Ohio from New York, but it is possible he had been a contractor there, helping him to secure winning this contract. Sadly the section of the canal that Seely built turned out to be the most difficult construction of the entire canal. Canal engineers noted this area of the Miami River washed against the base of bluffs, just south of Dayton, forcing the canal into these limestone bluffs in order to pass. A section equals two miles of canal. * 1827 25th day of April: Catharine Ann Huffman marries Morris Seely. There was a wide-spread belief in the community of Dayton, that if Parson Winters performed the ceremony, the marriage would be prosperous. Perhaps this explains the phenomenal number of 5,090 couples he married during his long ministry, including his sister-in-law Catharine Huffman to Morris Seely. 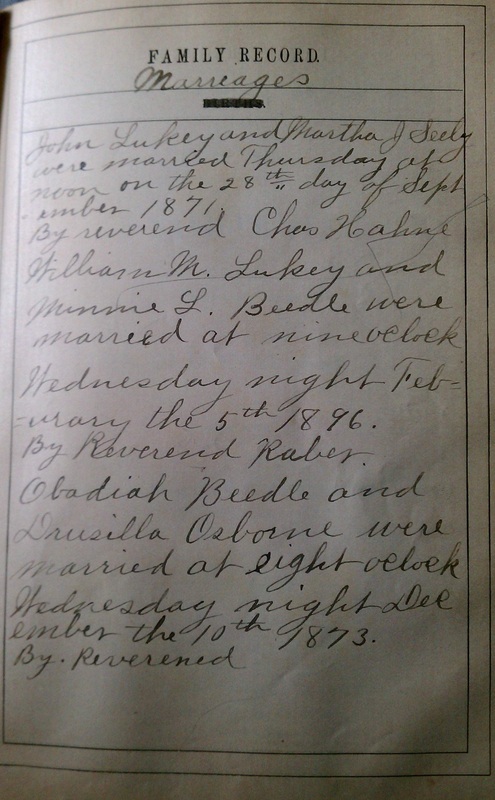 Catharine Huffamn-Seely and Morris Seely were joined in marriage on April 25th, 1827, by Catharine's brother-in-law, Rev. David Winters. David Winters was not the only minister in the Winter's family. He along with his brother Rev. Thomas Winters, along with several other prominent citizens, started the first church in Dayton, Ohio. William M. Seely Born: March 1828 at his Grandfather's hone: William Huffman  in Dayton, Ohio. Catherine E. Seely-Antrim, Born: 1828 Passed: 1880 in Butler Co. Buried in Germantown Cemetery. (* Marker) She married Cyrus Antrim December 31st, 1862 in Madison, Ohio. The second wife of Cryus Antrim. Were Catherine and William, twins? (unmarked grave) (First wife of Cyrus Antrim, who was Born: about 1825 in Ohio), Eliza married Cyrus on January 27th, 1851, in Hamilton Co. Ohio. Anna Marie Seely-Crawford Born: 1838 Passed: December 10th, 1907. Buried in Woodland Cemetery. Martha J. Seely-Lukey Born: 1841 Passed: Nov. 24th, 1908 Funeral: Linden Avenue Baptist Church. Burial: Nov. 27th, 1908 in Woodland Cemetery. Sec: 111 Lot: 3452 Age: 67.7 She married John Lukey,Sr. Thomas Jefferson Seely Born: 1843 Passed: June 3rd, 1863 The youngest child of Morris and Catherine Ann Huffman-Seely. Jefferson would have been 2 years old at the time of his Mother's passing and only 4 years old when Morris passed, and around two years old when his Mother passed. It is known that Jefferson went to live with his Grandparents, the Huffman's. The 1860 Census shows Jefferson living in the home of Daniel Bickford in Dayton, Ohio. In 1865 his Grandmother, Lydia Huffman would pass-on and the following year, his Grandfather William Huffman would join her. Jefferson joined the Union Army at age 18. * John W. Seely Born: 1852 Passed: June 7th, 1903 Buried June 9th, 1903 in Woodland Cemetery. Woodland Cemetery Sec. 101 Lot: 1351 In 1878 Clara married Thomas J. Keating, in Dayton, Ohio. grave.) But Woodland hard copy records show the pilot he was buried in. * Harvey T. Keating Born: 1880 Passed: December 5th, 1933 Burial: Woodland Cemetery on Jan. 28th, 1934, Cremation. * Ethel Keating Born: November 21st, 1881 Passed: August 4th, 1912 Buried: March 14th, 1913 at Woodland Cemetery in Dayton, Ohio. Section: 101 Lot: 1351 Seely Section. Ohio State University: piano soloist with Theodore Thomas Orchestra of Chicago. Married: Dr. John S. Boggess U.S.M.C. * Edwin Russell Keating Born: Aug. 5th, 1885 Passed: March 21st, 1907 (the youngest son, who passed on in 1907, age 21, although making no profession of music, was extremely gifted. While in college was one of the leading members of the mandolin and guitar club at OSU and had few equals as a cellist. Ohio State University Class of 1906: Major: Arts / Banking. * Oliver Henry Seely B: Aug. 21st, 1906 (Pueblo, CO.) Passed: July July 28th, 1991 in Los Angles County, CA. He was 84 years old. Married: Dorothy "Virginia" Tibbets-Seely B: Jan. 19th, 1906 in California. Passed: May 7th, 1n Los Angles County, CA. She was 91. 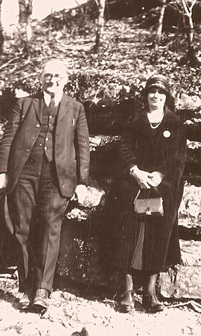 As of 1940, Alice Louise Seely is living with her son, Oliver H. Seely. (Alice's Father was Bridges Cabe.) Alice; Born: December 21st, 1868 Arkansas Passed: January 6th, 1947 in Los Angles County, CA. She was 78 years old. * 1828 Morris Seely builds a three story hotel near the site of his spur off of the Miami-Erie canal. Known originally as the National House. Morris would soon soon lose the hotel to his creditors. Seely had hoped to capture part of the commerce that the canal would bring to Dayton. * 1829-1830 Morris Seely is elected as an Ohio State Senator with John Turner State Representive. Morris representd both Montgomery and Miami Counties. Mr. Morris Seely or Wm. Morris Seely? Morris named his first born son, William Morris Seely. Was he "junior" or was he named William in respect to his Father-in-law William Huffman. Noting that, had his name truely been William Morris Seely, Morris may have chosen to drop the "William", as his father-in-law and brother-in-law were also both named "William". Just another small mystery in the life of Morris Seely. Archibald and Ziba Crawford  developed an odd-shaped lathe, just the thing for shaping blocks of wood into drivers, brassies and spoons. The name was changed in 1897 to MacGregor-Goldsmith and later to Mac-Gregor Sporting Goods. A competive company started the same year and was first by only 6 months, the A. G. Spalding, Co. The company was second only to Spaulding(by less than 6 months it appears) in developing a wooden driver for the game of golf. Second generation: Ziba Crawford  Born: 1833 Passed: Feb. 24th, 1900 Was the son of Archibald Crawford, named after Archibald's brother whom passed from Coholera. Married: Anna Seely Ziba was chairman of the financial committee for Denison University, from 1882 - 1889. 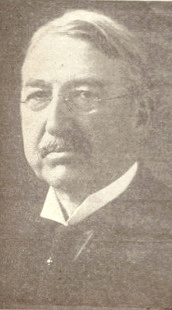 Ziba's wife's first cousin, Torrence Huffman took charge as chairman after 1900. 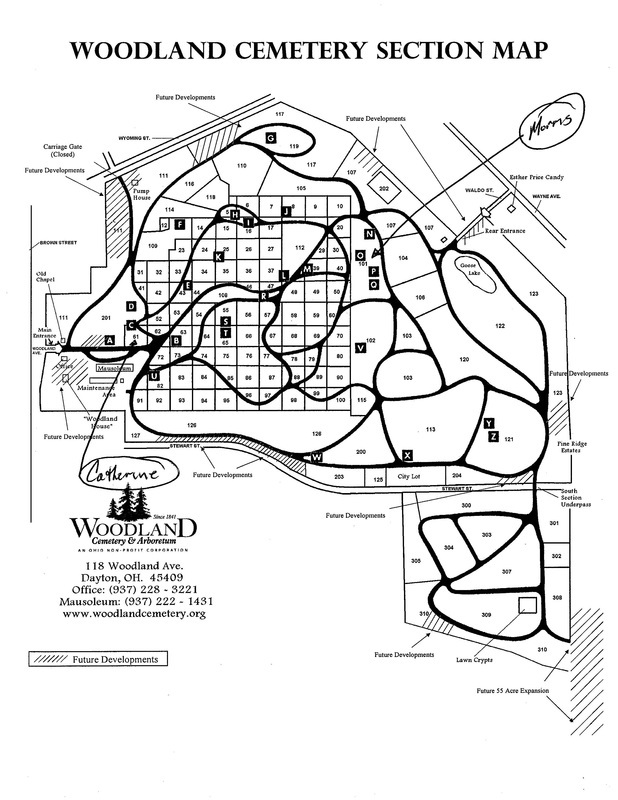 Ziba was also on the board of directors for Woodland Cemetery. A historian wrote, after a 1929 community observance of the firm's centennial, that in 1897 Crawford, McGregor & Canby were the first American manufacturer of golf clubs! Henry P. Cowen of Cincinnati and executive vice-president of the company in the 1930s, notes that might be debatable. Noting A.G. Spalding also started the same year and may have been first by about six months. 1829: Dayton Last Works - Archibald and brother Ziba Crawford start business. Fresh from New York. 1930s: Name of company changed to MacGregor Golf Co.
1950s: Eye-O-Matic clubs are introduced. 1967: Brunswick Corporation buys MacGregor. 1979: Brunswick sells company to Wickes Corporation. 1982: Jack Nicklaus-led group buys control of the firm. 1984: Majority stake in Japanese subsidiary is sold to Suntory. 1986: Finnish conglomerate Amer Sport buys MacGregor. 1997: Sale to consortium led by Masters International of the United Kingdom. 1999:B arry Schneider's Parkside Group buys the company. Edwin Crawford Baird, civil engineer and contractor for the City of Dayton. He is a native of the city and was born May 28th, 1856. His grandfather Danial Baird, was from Somerset, Pennsylvania where his Father, Josiah Baird was born in 1831. He married in 1854 to Miss Catherine Crawford, the daughter of Archibald Crawford. In May of 1908, Edwin was appointed assistant State Engineer in change of improvements of the Miami-Erie Canal. 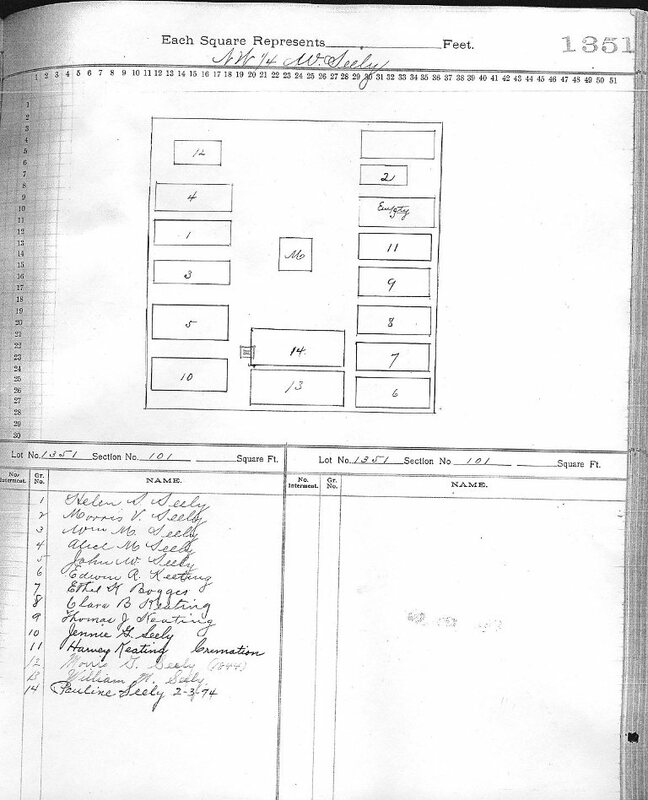 * 1830 Census notes Morris and Catherine Seely living next door to William Huffman. 1 adult male (30-40 years old - Morris), 1 adult female (20-30 years old - Catherine Ann), and 1 male child. (William Morris Seely, no record of daughter Catherine.) There were in 1830 prior to the canal being completed, 1,168 people living in Dayton! After the cancal was completed that number grew to 2,954 individuals. * 1830 A company is formed to construct a basin, connecting the Miami-Erie canal at its intersection with Wayne Street (Avenue) and a point at the southern extremity of the city of Dayton. Morris Seely is the main mover in this project. Morris Seely was a visionary. Maybe for his own hopes of grandeur or possibly in hopes of proving himself to his father-in-law, William Huffman . Seely pursued his greatest vision, a navigable canal through the undeveloped area east of town and east of the new Miami Canal connecting the canal's Mad River feeder (near what is now, Wayne Avenue) to the main line of the canal below town near the Fairgrounds hill. Seely purchased a large quantity of land, commencing at Thrid Street, running south to dig the canal parallel with Wayne Avenue to Fifth Street. East on Fifth to P. E. Gilbert's planing-mill, thence south and west, making elbows and turns for basins, until it crossed the junction of Brown and Warren streets, then west to the main canal. This feeder, although owned by the state, was mostly located within property controlled by the trustees of the estate of Daniel Cooper, the original proprietor of Dayton, and the trustees of this estate refused to provide any access the property to the feeder for hydraulic (water power) purposes. Seely, however, managed to acquire at least two lots that touched upon the feeder. He then offered to sell one of these lots to the state of Ohio to lease out for the construction of a mill, thinking could use the tail race from the mill to provide water for his new canal. In addition to digging the new canal spur, he purchased additional land through which his canal would flow, and platted it into nearly 300 small lots, which he believed would be ideal for industrial (water power) and commercial use. When the money ran out and the project failed, the lots on Fifth and Wayne Streets sold at public auction from as little as five dollars to fifty dollars. The "ditch" seemed to only attract mosquitoes and houses of ill-repute. A. M. Peasley established a pleasure garden on the west side of Warren Street, thinking parties would come down the canal for pleasure and refreshments but it was not a success, and was abandoned. time than it would take us to go to Cincinnati by canal. * 1833-1834 Morris Seely served in the Ohio House as State Representative. * 1833 Rev.Winters organizes the First Reformed Church with six members. His wife, Mary Huffman-Winters pays for the ground the church will be located on. Located on Ludlow Street, it was considered to be one of the most attractive examples of architecture in the area. For seventeen years, Rev. David Winters preaches his sermons there, alternately in German and English. It was said the crowds were so large that extra benches had to be brought in. He was gifted with both a beautiful speaking and singing voice. His favorite hymn was “There Is A Light in the Window For Me.” He was also noted for his lengthy prayers. * 1833 November: A Hook & Ladder Company was organized. Safety Fire Engine and Hose Company Number 1. Assistant leader; William P. Huffman . * 1836 David Zeigler Cooper executed a deed to the city releasing his interest in lots 94, 95, and 96, with the under-standing that they should be leased and the income used in improving the common, enclosing it, and keeping it as "a walk" for the "citizens of Dayton and its visitors." In April of that year, the Council desired to negotiate a loan for one to ten thousand dollars, with which to extend the market-house to Jefferson Street, grade the streets, and improve the common. Although some objected that the improvements were more for ornament than actual use, and that taxes would be increased, the loan was authorized and the Council recommended to use one-tenth of the money expended in filling Seely's ditch. * 1837 William P. Huffman  takes up farming. * 1837 Martha J. Seely is born to Catharine Ann Huffman-Seely and Morris Seely. * Frank T. Huffman Born: 1857 Passed: April 3rd, 1933 Buried: at Woodland Cemetery. * 1838 The National Road (Route 40) was our country's first Federally-funded "interstate" highway. The road started in Cumberland, MD and headed west, inching through the forests of Western Pennsylvania and Ohio ending in St. Louis, MO. It reached Springfield, Ohio in 1838 then for twelve years construction on the National Road stopped from 1838-1850. Great efforts were made by Dayton, Ohio to have the route changed and directed towards Dayton, and not Springfield. 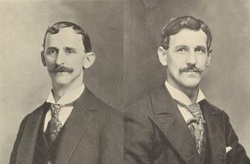 Joseph Barnett and Morris Seely were sent to Washington DC to argue for a change in route. The principal objection raised by the Springfield, Ohio delegation was... "the road would then not be straight." This arguement carried a lot of weight with the road committee. * 1839 19th of February: Special Report of the Board of Canal Commissioners in reply to a Resolution of The Senate relative to resoulve the Claim of Morris Seely. * 1839 April: Catharine Huffman Seely sends a letter to her Mother complaining of mis-treatment, and notes that debts of her husband Morris to her Father William Huffman have been paid. (Including the rent of the house she and Morris were living in, which belonged to William Huffman.) Catharine notes this re-payment should put her on par with her sibblings in reguards to her Father's will. She also touches on the topic that her Mother would like to see them move away and that Catharine was advised to abandon her husband, noting she and the children would be better off without him. Most likely as Morris was an embarressment to the Huffman family. Catharine notes that Morris was not lazy, but ill and unable to work. Catharine worries she and her children will be cast out into the streets without a roof over their heads or food to eat. She notes, in the letter, that she and her husband Morris moved out of the Huffman household on April 1st, 1839. Founded in 1849 by E.E. (Eliam Eliakim) Barney and Ebenezer Thresher as the Thresher, Packard, & Company. Mr. Packard was a silent investor from the east. Barney and Thresher are strong examples of industrial intestinal fortitude! They started building railroad cars two years prior to Dayton having a railroad line into the city. The demand was so great for their cars, they would build their passinger and sleeping cars and then pull them by horses to the nearest rail terminal, several miles south of Dayton, Ohio. E. E. Barney pictured. 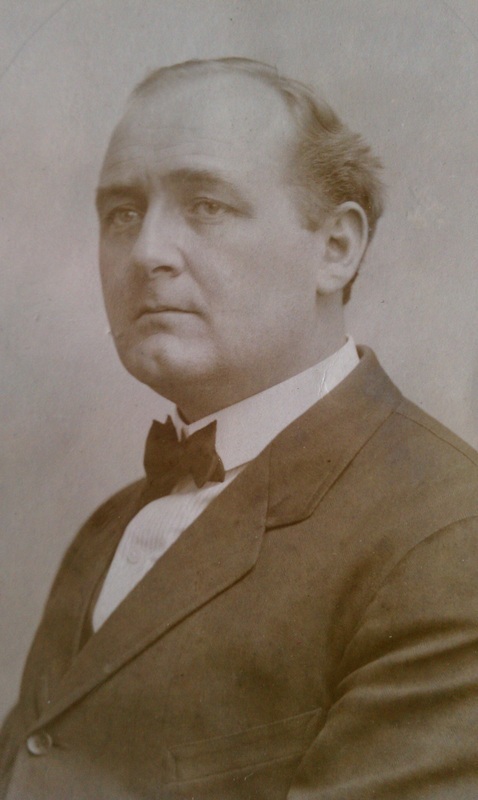 Father to E. J. Barney. E.E. Barney was the son of Benjamin and Nancy Potter-Barney. Both Mr. and Mrs E.E. Barney were active members of the Bapist Church. They came to Dayton, Ohio in the fall of 1833. Mr. Barney taught six months at Dennison University before becoming the Principal of the Dayton Academy. 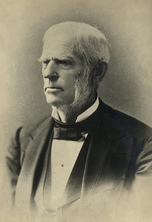 Inaddition to the Barney & Smith Company, Eliam Barney was the Vice-President of the Second National Bank, a director of the Wisconsin Central Railroad and President of the Cooper Hydraulic Company. E.E. Barney was married on October 10th, 1834 to Miss Julia Smith, daughter of Dudley Smith of Galway, New York. Together they had six children. E.E. Barney would pass on December 17th, 1880 and is buried at Woodlawn Cemetery in Dayton, Ohio. * 1839 12th day of February: Eugene Judson Barney is born in Dayton, Ohio. 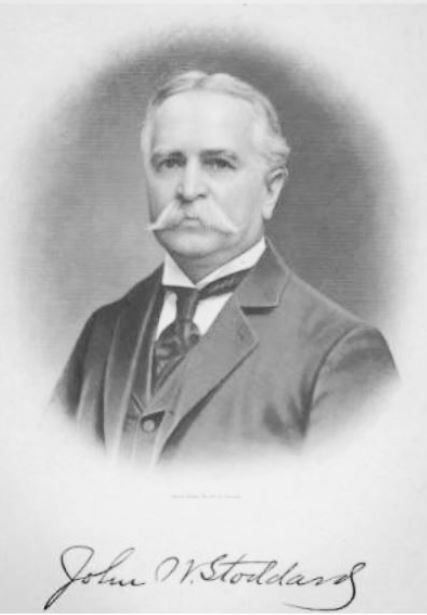 In 1877 he is elected Vice-President and Superindent of the Barney and Smith Manufacturing & Car Company. On October 1st, 1881 his Father passes and he becomes, President of the company. (Until Jan. 1st, 1900.) E. J. Barney would later marry Miss Martha Bell Huffman, daughter of William P. Huffman, on February 12th, 1862. The Barney and Smith Car Company would face many challenges. At the beginning of the Civil War, it appeared the war would put an end to the company. But soon the U. S. Goverment began ordering cars for the Union Forces. In the 1890s they faced competition from larger competitors such as Pullman. The company went into receivership in 1913 due to the 1913 Flood, which nearly completely distroyed the company. The company would finally close its doors for good in 1921. After the Great Dayton Flood of 1913, an article appeared in the New York Times, noting Mr. E.J. Barney appeared the morning after the flood at the National Cash Register Depot, the location where food and supplies were given out, as a relief to the flood victims. They published he was offering a $1,000 for enough alcohol to heat milk for his infant grandchild. He was grateful to recieve a basket filled with beans, potatoes, canned vegetables, rice and other supplies. Which he was eager to pay for, but money was rejected. The goods were offered to all equally. The next day, the decission was made to allow those who could pay to pay and the money was applied to the relief fund. Eugene Judson Barney passed four years after the flood on September 4th, 1917 and is buried in the Barney Family section, Sec. 102 Lot 1492 at Woodland Cemetery. Martha Belle Huffman-Barney passed January 5th, 1906 and is buried with her husband at Woodland Cemetery. * 1841, March: Morris Seely becomes Major of Dayton. He resigned on April 12th of that year, after only serving in office for one month. * 1842: Morris Seely declares bankruptcy. * 1842 December: The following City Council was elected: First Ward in Dayton, George C. Davis; Second Ward, Peter Odlin; Third Ward, and William Huffman . * 1843, November 22nd: William J. Jones is born. (Not related) But, worked for the Seely family later in his life. W. J. Jones was raised on the farm in Hamilton and Butler counties, and received a common-school education. When about nineteen years of age he learned the carpenter's trade, which he followed for about three years. 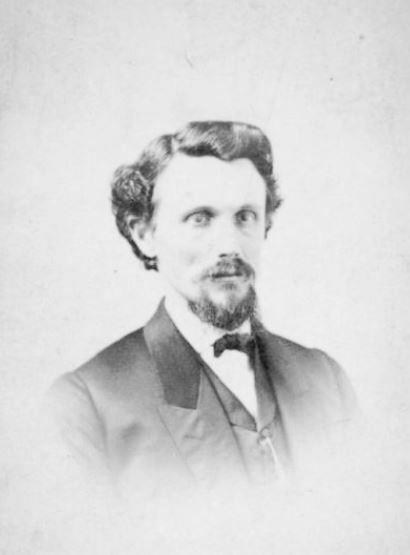 In February, 1866, he came to Dayton and entered Greer's Commercial college and took the full course, leaving, however, before receiving his diploma, to take temporary charge of a set of books for the firm of Haas & Mitchell. Two months later he returned to college, intending to remain until he obtained a diploma, but being considered by the principal as proficient, he was given his diploma without further study. He then took charge of the books of the lumber firm of William M. Seeley & Co., with which firm he remained about three and a half years, leaving there to take charge of the books of D. W. Stewart & Co., where he remained for seven years. He was next bookkeeper for C. Wight & Son, with whom he remained until December 1, 1879, when he took a similar position with J. W. Stoddard & Co. In 1884, when this firm was incorporated into the Stoddard Manufacturing Company. Mr. Jones became a stockholder, and in 1886 was elected treasurer of the company. Mr. Jones passed in May of 1893. His wife passed the following year in December of 1894. * 1843 December Term: Ohio Supreme Court. The Supreme Court of Ohio, in the first case in late 1842 or early 1843 gave Morris Seely $9,506 (but it may be that the $5,000 he already had received from the General Assembly.) The state didn't like the result, and petitioned for a rehearing, which occurred in December of 1843, but the Court upheld the earlier decision. A couple of interesting things are revealed: (i) Seely filed a petition in insolvency in Hamilton County in 1832 (there is much back and forth as to whether Seely was entitled to the money, or whether it's actually his creditors, who were not party to the suit), (ii) Seely was still alive in December, 1844, when the rehearing occurred, (iii) we now know who supervised construction of the "ditch" (someone named William Mershon. Dayton history lists, Judge William H. Mershon and being born in MIddlesex county, NJ. He moved to Dayton in 1832. He later moved to Pendleton, Indiana. Note: the Huffman's were from Middlesex County, NJ. also. In 1842, Mershon was elected probate judge. In 1851, the Judge moved to Anderson, Indiana until his death in 1864. ), and (iv) Seely had high powered legal counsel. Congressman Thomas Corwin (the "Ohio Wagon Boy") from Lebanon and prominent Dayton lawyer Peter Lowe (brother of John Lowe). At this time Morris Seely was serving in the Ohio Senate. 1845 18th day of April: The passing of Catharine Ann Huffman-Seely. 35 years, 9 months, 18 days. Ziba C. (Crawford) Seeley (Seely) Died August 4th, 1865 Age: 11 months Sec. 61 Lot 183 Grandson of Catherine Ann Huffman-Seely. Infant son of William M. and Helen Seely. Only three members of the Seely family were allowed burial in the Huffman family section at Woodland Cemetery in Dayton, Ohio. HUFFMAN: Daughter Catharine Ann Huffman-Seely. Grandson, David Seely, and Great Grandson Ziba Crawford Seely. * 1847 July: Oddly, for a man who lived in the public eye and the shadow of his Father-in-law and bother-in-law... (William Huffman and William P. Huffman) very little is know about Morris Seely. In addition to large land purchases by Morris, we do know he build four sections of the Miami-Erie canal though what is now downtown Dayton, Ohio... Served as both a Senator and in the Ohio House of Repersentives. Was elected as Major of Dayton, though for reasons unknown, only servered in that position for a month of the term. Morris filed for bankruptcy soon after, which may have been the reason behind his relinquishing that office. Was there a Seely curse? It seems as though there must have been. While it is true that Morris constructed those four sections of the canal that he contracted for. Engneers say it was the hardest four sections on the entire canal route. He lost money. Lawsuits were filed against the state in an attempt to recover those loses. Morris also built a spur off of the main canal, with visions of industry springing up around the spur. Instead, only mosquitoes flurished and more lawsuits followed, in a battle to see who controlled the water rights. This vision ended with an angry mob bearing picks and shovels, planning to fill in the ditch. 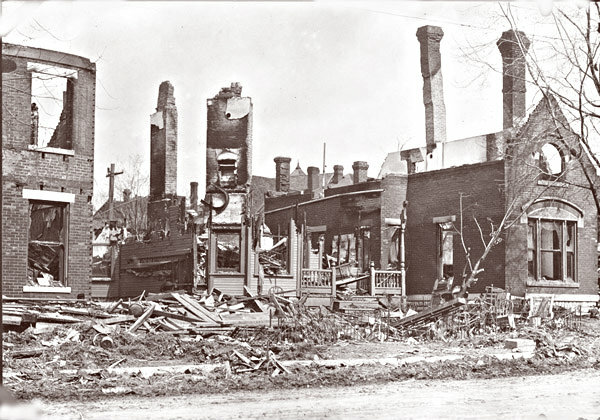 And when the smoke cleared the saw mill owned by Mr. Ebenezer Thresher had been burned to the ground. Morris built a hotel that ended up in the hands of his creditors. The National Hotel. 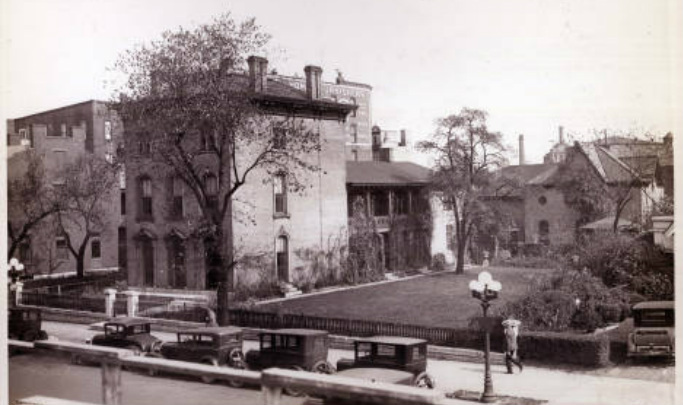 Right next to that hotel, his in-laws build a differant hotel, the Bickel House, that was very successful and later consummed the hotel that Seely built, by being torn down to make way for an addition to the Bickel House. This curse seemed to even extend to his sons. Five sons, only one lived into his 40s. One of the sons, Morris V. Seely passed at age 4 1/2. Two of the boys, Jefferson and David Seely passed at age 20, it appears. 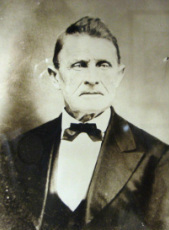 William M. Seely, the oldest Seely child, was the son that lived to age 48. And it seems, the curse even extended to son William. On June 16th, 1876 William was returning to Dayton, by train. As the train approached Dayton on the Short Line from the South, William M. Seely was standing on the rear platform when he was thrown from the train. Falling backwards, William suffered a fracture to the right side of his skull. William was taken to his home located on the corner of 3rd and Huffman Avenue, where he passed later that evening at 9:10pm. William's Father, Morris only lived to age 47. There is little to no information about the fifth son, Thomas J. Seely. Even in death Morris Seely remains a mystery. 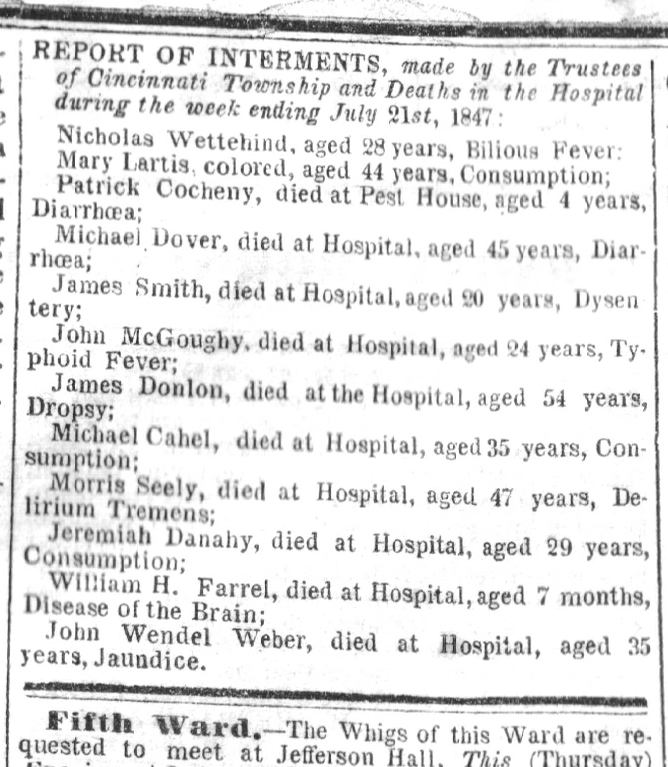 Recently a notice of his death was found in the Cincinnati Daily Gazette, noting Morris passed on or around July 21st (a Wednesday) in the year 1847. No additional details of his burial, what hospital he may have passed in, nor suggestion as to where he was buried. It is possible Morris may be or had been placed in a pauper's grave and we may never know the answers to questions concerning his life. second is listed only as: “Unknown Seeley”. Two: Family members related to Morris are buried in that same section, including his oldest son William Morris Seely, son Morris V. Seely, William M. Seely’s wife Helen S. Seely, grand-daughter Clara B. Seely-Keating, her husband Thomas J. Keating of Columbus, Ohio, great grandson Harvey T. Keating, great grandson Edwin B. Keating whom also was moved from Green Lawn Cemetery in Columbus, Ohio., grandson John W. Seely, John’s wife Jennie G. Seely, and Alice M. Seely; born in Cincinnati around 1850 (Daughter of William M. and Helen Seely.) Side note: all of the other Seely members buried in that section are spelled correctly, as "Seely", with exception to the two "Seeley" individuals, noted above. Morris's son, William Morris Seely purchased a single burial pilot in Section: 72 Lot: 1354 at Woodland Cemetery. On-line Woodland Cemetery search records indicated that (Morris's son) William Morris Seely was buried there. But son William purchased a whole section at Woodland and is confirmed, that he is buried in that "Seely" Section at Woodland. This is also confirmed with cemetery hard copy records, head stone and foot stone bearing his name, birth year, and date of his death. He is buried along side his wife Helen, four year old son Morris G. Seely, younger brother Morris V. Seely spelled Seeley in cemetery records along with his children and grandson. So, whom might be buried in the single grave across the drive from Catharine Ann Huffman-Seely? As Morris was most likely banned from being buried in the William Huffman family vault, due to their dislike for him. This may be as close as oldest son William could place his Father to be near his Mother in the after life. * Fact: Catharine Seely writes her Mother and notes husband Morris' failing health. * Fact: Catharine Huffman-Seely passes. * Fact: William M. Seely was running a Dry Goods Store in Hamilton County in 1846. * Fact: Morris Seely died in Hamilton County in 1847. * Fact: William M. Seely and Helen Spaulding married in Hamilton County in 1848. Upon Morris Seely's death, daughters Catharine (about 19) and Martha (about 6), along with son, Jefferson (about 4), went to live with their grandparents, the William and Lydia Huffman. There is no mention of David Seely (age 15) going to live with his Grandparents after his Father's death. He would have been around fifteen years old at the time. He would pass only five years later and is the only Seely child to be buried with his Mother Catherine Ann Seely-Huffman, in the Huffman family section at Woodland Cemetery. 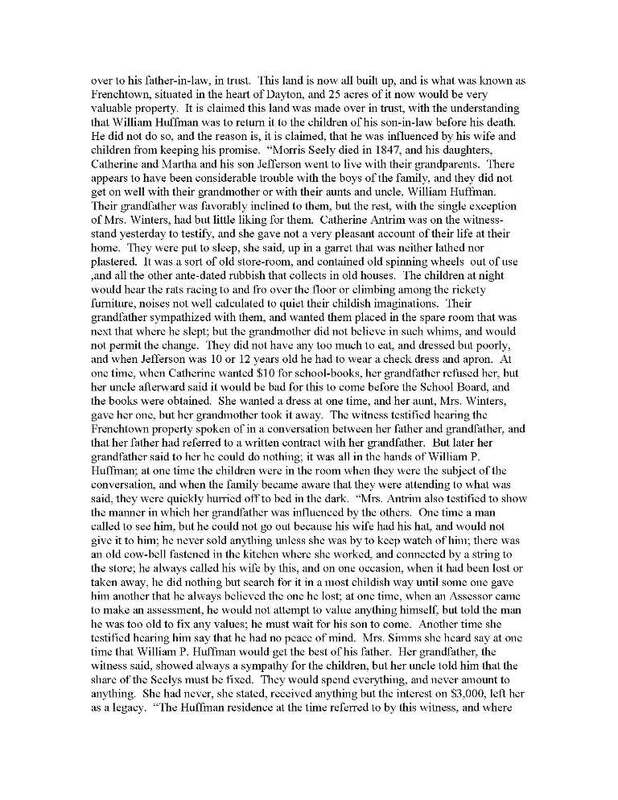 Their grandfather, William Huffman was favorably inclined to his grandchildren, but the rest of the family, with expection to Mrs. (David) Winters, had little liking for them. It is said, there was trouble with the "boys", as they did not get-a-long with their grandmother, aunts, or even their uncle William P. Huffman. "Boys" would also suggest, that Jefferson was not the only son to move in with the Huffman's. The Seely children were made to sleep in what was refered to as a garret. The room was neither lathed nor plastered. It was used to store old spinning wheels and other antiquated rubbish that collects in an old home. It was noted, the children could hear the rats running across the floors at night. Their grandfather sympathized with the children, and wanted them placed in the room next to his sleeping room, but now nearly 80, had to bend to the wishes of his wife and son. Mrs. Huffman controlled her husband, so much, that Mr. Huffman once received a caller. Mrs. Huffman did not wish her husband to engage with the visitor, so kept Mr. Huffman's hat from him, preventing him from going outside. [People lived by a whole different set of rules back then.] Mr. Huffman could not sell something in their store without Mrs. Huffman's approval. She ran a string from the store, back to her kitchen with a cow bell attached. So that Mr. Huffman could "ring for approval" prior to making a sale. The children received barely enough to eat. They were dressed poorly, to the point that Jefferson was made to wear a ragged old dress and apron. Catharine (the Seely daughter) needed ten dollars for school books, she was refused the request, but it was later resended when William P. Huffman said it would look bad, if the school board would discover, so to save face Catherine received her books. 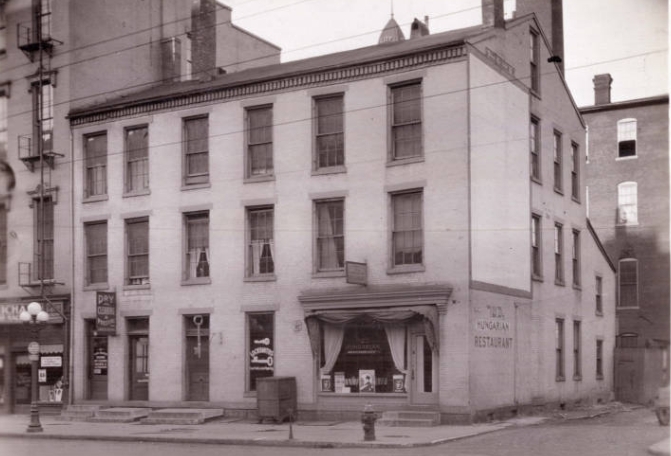 * 1848 The Dayton Gas Light Company was incorporated and built their plant at Monument Street and the Miami-Erie Canal. Pipes were layed in the street to supply gas to the street lights and to homes for gas lighting. 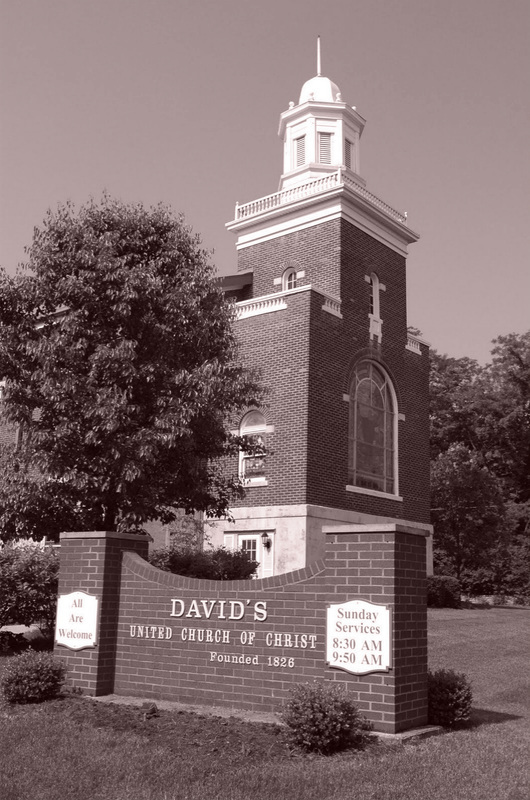 * 1850 David Winters resigned his pastorate at First Reformed Church to devote more time to the rural churches which for many years he had been serving as a circuit-rider minister. Zion Church formed in 1820 was one of these. Zion was a High German Reformed Church and David Winters preached there in both the German and English languages. * 1850 Census for Dayton, (Montgomery County) Ohio Shows for the Huffman household: William Huffman; Age 87, Lydia Huffman; Age 71, John Holloway; Age 50 Laborer (Born in New Jersey), Eliza Seeley; Age 16, Martha; Age 9, Jefferson; Age 7. * 1851 Xenia was only fourteen miles away and a good walker could walk there in about four hours. Then take the train for five hours and still beat the canal boat by more than a half day! Daniel Beckel, T.J. Smith, E. E. Barney and F. D. Edgar and others got busy and subscribed the money to build a rail line to Springfield and join-up with the Madriver & Lake Erie rail line. This was complete in the spring of 1851 In 1852, the Cincinnati, Hamilton and Dayton was built to Dayton and in 1853 the Dayton & Western, the Dayton & Xenia, and the Greenville and Miami, now the D, G & U, (Dayton, Greenville, Union City), came to Dayton and Dayton became a railroad center almost over night. 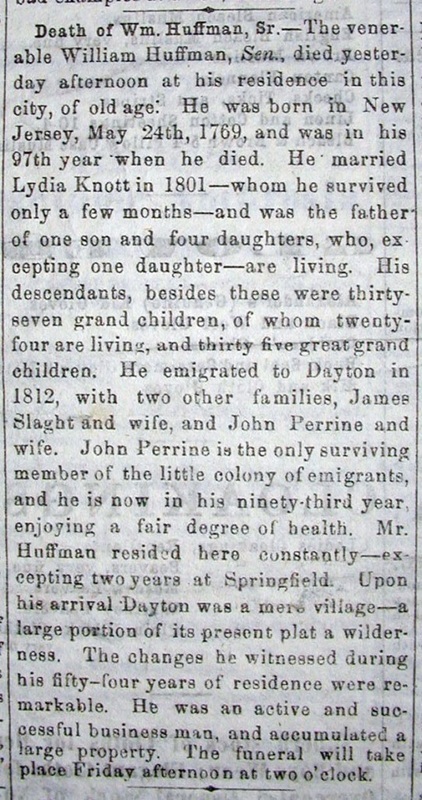 * 1848 William P. Huffman  returns to Dayton. 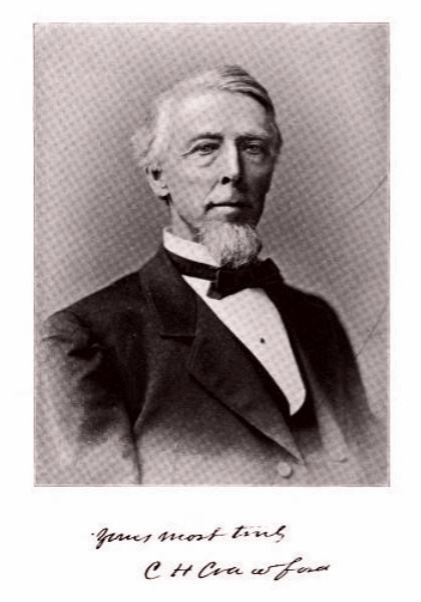 He devotes his time to Real Estate, the Third Street Railway, construction and paving of the Dayton & Springfield Pike, Cooper Hydraulic Canal, President of the Second National Bank, Third National Bank, served as trustee of Denison University at Granville, Ohio and was a member of the Linden Ave. Baptist Church in Dayton. Up to 1887. "Contains business transactions of Wm. 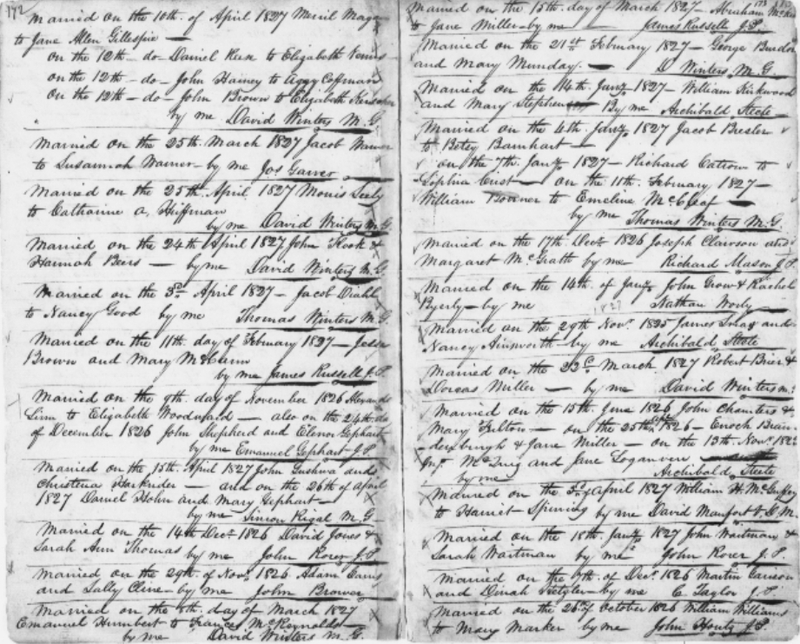 Huffman Sr."
A recent discovery amongst family items is one of the ledgers penned by Wm. Huffman. 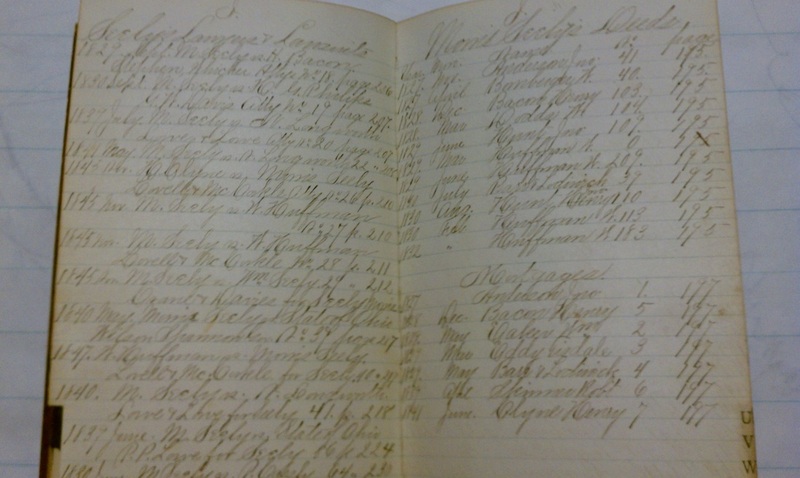 The ledger contains information concernings Deeds, mortages, and even record of law suits. More time will be devoted to see what additional information this ledger may yield. An interesting side note... The ledger does show land transactions between Morris Seely and many prominent Dayton citizens of the time. 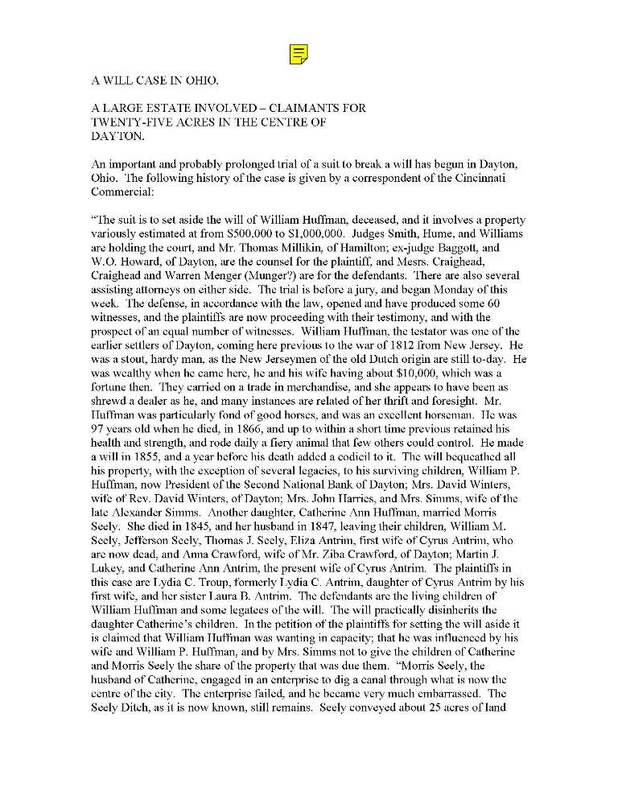 Upon researching the name Henry Bacon, Dayton history notes: "Among the early settlers of Dayton were Henry Bacon, Luther Bruen, and Jonathan Harshman. Mr. Bacon was a successful lawyer, and a man of unusual legal as well as literary acquirements. He served as prosecuting attorney, and ably discharged the duties of the office. "The leading and most prominent members of the Dayton bar at that time (1831) were Joseph H. Crane, Henry Bacon, Henry Stoddard, Peter P. Lowe, Judge Holt, Edward W. Davies, Thomas J. S. Smith, and Robert A. Thruston." "Henry Bacon under a careless personal appearance and dress, and sometimes moody manner, con-cealed much force and keenness, and waked up sometimes in addressing a jury, especially as a prosecutor in criminal cases, to flashes of eloquence." Newark and dedicate it. This was a chance for Dayton and they took it. James Steele and Henry Bacon to Newark to invite the Governor to come to Dayton, to boost the idea of a canal. One can visualize what the canal was to Dayton. It put Dayton definitely at the head of navigation, as wagons coming down the valley could shift their cargo to a boat and send it straight to Cincinnati. The canal basin on Second Street was a crowded and busy place, the banks piled with merchandise. Another name from the ledger is Wm. Dodds. "William Dodds, the eldest son of John M. and Mary Dodds, and father of Charles W. Dodds, was born in Miami township, February 7, 1823. As a boy he worked in his father's mill; later boated on the canal, and for twenty-five years was a resident of Miamisburg, where he was engaged as a contractor. His wife, Mary was a daughter of Conrad and Mary (Lemon) Dodro, formerly of Lancaster County, Pa., and pioneers of Dayton. Conrad Dodro was a fuller and carder by trade, also taught school, was for many years a resident of Dayton, and passed while on a visit to his old home in Pennsylvania. William Dodds was the father of nine children: Otto F., Perry, Lizzie (Mrs. Dr. B. F. Mullen), Charles W., Ella (Mrs. Lee Silberman), Emma (Mrs. S. F. Evans), Clay, Clarence and Lehm. Mr. Dodds died in Miamisburg in 1873 and his wife, Mary, passed in 1881. William Bomberger was born in Philadelphia, April 7, 1779. His parents were Quakers, and in that faith he was reared and lived until his death. When eighteen years of age he was shot by the accidental discharge of his gun while hunting, and from the effects of the wound was always a delicate man, although he lived to be seventy-seven years of age. He came to Dayton about 1806 or 1807. He was a quiet, peaceable citizen, upright, honest, and conscientious in all things. He held the office of Treasurer of Montgomery County for fourteen years. He brought some means with him and purchased a good deal of property in the eastern and south-eastern part of Dayton, to which he retired in 1842 and spent the remainder of his life, which ended December 19,1855. In 1810 he married Sarah George, daughter of William George, and had three children: George Wilson, who died, while Mayor of Dayton, June 6, 1848, in the thirty-sixth year of his age; Ann, who married Peter P. Lowe, and William, who married Matilda Gallup and moved to Colorado. William Eaker came to Dayton from Carlisle, Pennsylvania. From an early period Mr. Eaker was extensively engaged here in the business of merchandising and flatboating to New Orleans. His store was very popular with country people, and he amassed a large fortune. William married Lucretia Lowrie, of Springfield, Ohio. Two additional prominent citizens of this time period were Obadiah B. Conover and William Huffman. Eaker lived in the same house with his sister Miss Belle Eaker. With William preceeding her in death, Belle willed their home to the YMCA. The house next door was also purchased prior to her death, had been owned by John H. Winters, she included it in her gift to the local YMAC. 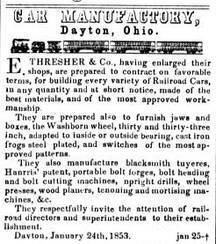 * 1849 Eliam E. Barney and Ebenezer Thresher formed a partnership they called the Dayton Car Works to build cars for horse-drawn street railways. (Trolly cars) The first Barney-built railroad sleeping cars came out of the factory in 1855. Barney supplied them ready-to-run, including blankets, quilts and pillow cases. By 1859, Barney-Parker employed 1,250 individuals, building among other things, sleeping cars for private individuals who operated them on southern railroads. Barney-Parker sold cars to many southern railroads, and when the Civil War came, was stuck for payment. The company sent men south to physically reclaim any unpaid equipment, a tactic that was reasonably successful. The war brought recession, and things began to look grim. But the railroads up north needed cars for the war effort, and by the middle of the war the car works was working at full capacity, building almost exclusively for the military (at the usual inflated prices, of course). By about 1855, Ebenezer Thresher’s (Not Directly Related) health was again failing, and so he sold out his interest in the railroad car manufacturing company & permanently retired from it. The company changed owners and names a few more times before becoming, in 1865, the “Barney and Smith Manufacturing Company,” the name by which it is best known. The original name of the company was “Thresher, Packard, & Company,” with Packard being an investor from the East, and Barney being a silent partner at first. Sometime before his final retirement from business, Ebenezer Thresher built himself a fine new residence on the southwest corner of First and Main streets, two doors from the First Baptist Church. He lived the rest of his life there. Despite his poor health in middle age, Ebenezer Thresher lived to be 87 years old, and maintained most of his physical and mental faculties until the end. On January 12, 1886, he suddenly became ill and died later that same day. Ebenezer Thresher was buried on January 14, 1886, in Woodland Cemetery in Dayton, Ohio, next to his wives. (1) Elizabeth (Fenner) Thresher. (2) Martha Wilson (Henderson) Snyder, the widow of the Baptist minister Frederick Snyder. Ebenezer Thresher had a deep interest in Denison University, a Baptist-affiliated college in Granville, Ohio. He made generous financial contributions to the school over the years. Barney & Smith was reportedly the largest car builder in the nation until Pullman opened his big plant near Chicago in 1881. In that year Barney & Smith employed more than 1,500 workers. 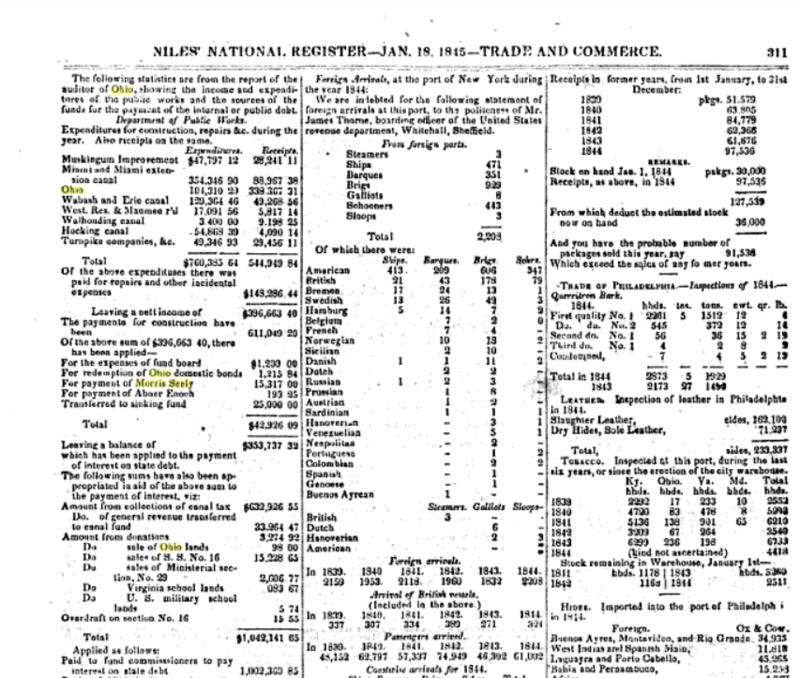 In 1882, capital stock in the company was increased to $1 million to support further growth of the firm. In 1839, Archibald Crawford and Ziba Crawford  invited their nephew Charles Henry Crawford to move from Milton Center, Saratoga County, in New York to join them in Dayton, Ohio. They invited him to take a position in their factory, located in Dayton, Ohio. It took him eleven days and ten nights to make the trip. His Uncles had just completed a new building along the Miami-Erie Cancel, in Dayton. (The building is still standing.) With-in three years, Charles Crawford became the third owner of the business and remained with the company the rest of his "working" life. 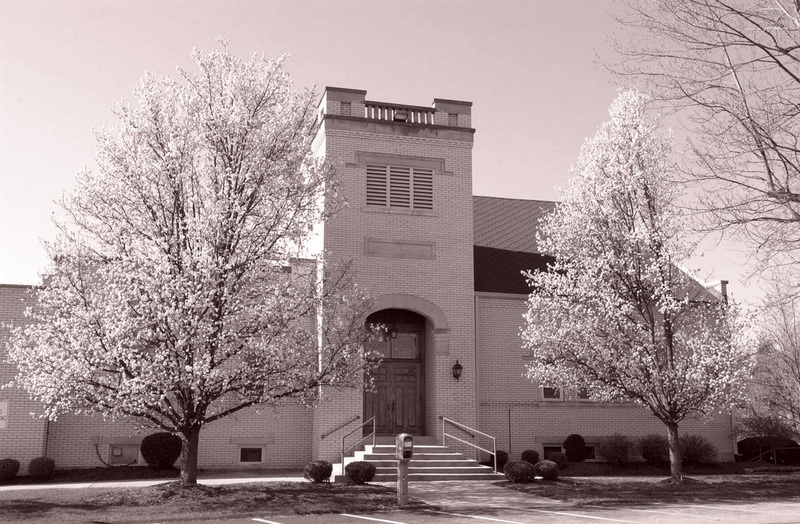 Charles Crawford became a member of the First Baptist Church in Dayton, Ohio soon after he arrived there. Charles was baptized soon after by Rev. John L. Moore. He married Miss Melvina Smith, of New Carlisle, Ohio on September 15th, 1846. (Who had been his schoolmate back in Saratoga, New York.) Melvina Crawford would pass-on not a full year after their marriage in August of 1847. Three years later Charles would marry again, this time to Miss Sarah J. Comstock of Hoosic Falls, New York. She was a teacher of Music at the Cooper Academy in Dayton, Ohio when E.E. Barney was the Principle there. Sadly, two years into their marriage Sarah would also pass-on. In 1856, Charles would marry Miss Sarah N. Thresher, daughter of Ebenezer Thresher. Their marriage would last twenty-four years, until Sarah would pass after a lingering illness, leaving Charles a widower for a third time. Charles would pass on November 25th, 1887 after enduring several weeks of a low grade fever. Funeral services occurred the following Monday at the First Baptist Church and his remains were laid to rest at Woodlawn Cemetery in Dayton, Ohio. William Havelock Crawford . Born November 22nd, 1863 in Dayton, Ohio. William was the son of Charles Henry Crawford and Sarah Thresher-Crawford. He received his preliminary education in the second district school and subsequently attended the Cooper Academy and later attended the Miami Commercial College. In 1883 he began working in his Father's last business of, then Crawford & Coffman and Company. In 1887 upon the death of his Father, William took charge of the business. In 1886 the firm of Crawford, Coffman, & Co. became Crawford, McGreger and Canby and continued under this partnership until March of 1896 when it was incorporated. In 1884, William Crawford was instrumental in organizing the Last Maker's National Association which consisted of thirty-seven members. He was elected its first President. A position he held on three occasions. He also severed on the Dayton Board of Trade and the Homestead Aide Association. William re-married on November 4th, 1886 to Miss Mary A. Cunningham. Mary was the daughter of D.O. Cunningham, a glass manufacturer in Pittsburgh. The union produced three children: Marie Madeline Crawford, Charles Henry Crawford, and William Havelock Crawford . The family are members of the First Baptist Church in Dayton, Ohio. William was also a member of the Dayton Club and the Young Men's Christian Association. * 1853 Construction begins on the Beckel House. 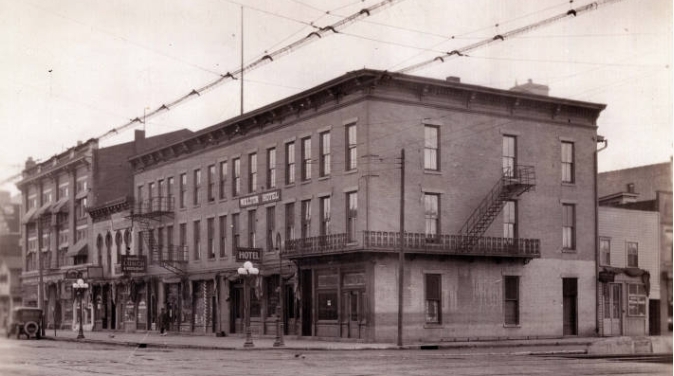 (Beckel House Hotel) Completed in 1866, ajoining the National Hotel on Third Street. 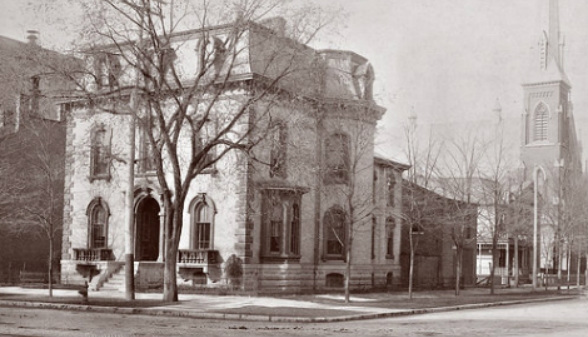 The National House was torn down later and a new wing to the Beckel House was added. The Hotel was built on land owned by William Huffman . Attached to William's  home, known for being the first stone home in Dayton. Torrence Huffman married Annie Beckel. Torrence was the grandson to William Huffman  that owned the land where the Beckel House / Hotel was built. Currently, nothing of the Beckel House remains. It serves as a parking lot for the city of Dayton, Ohio. * 1855 20th day of March Torrence Huffman is born to William P. Huffman  and wife Anna M. Tate-Huffman. * Director for Columbia Insurance Company. * 1857 Frank T. Huffman is born to William P. Huffman  and Anna Tate-Huffman. 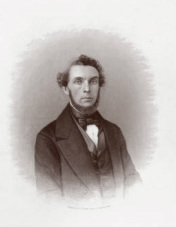 He attended the Dayton public schools, then went to Denison University at Granville, while subsequently pursuing a special course in civil engineering under Dr. Dickinson near Trevilians Station, Virginia. They had three children. 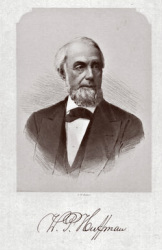 Daniel Bickford was born in 1805 in New Hampshire. 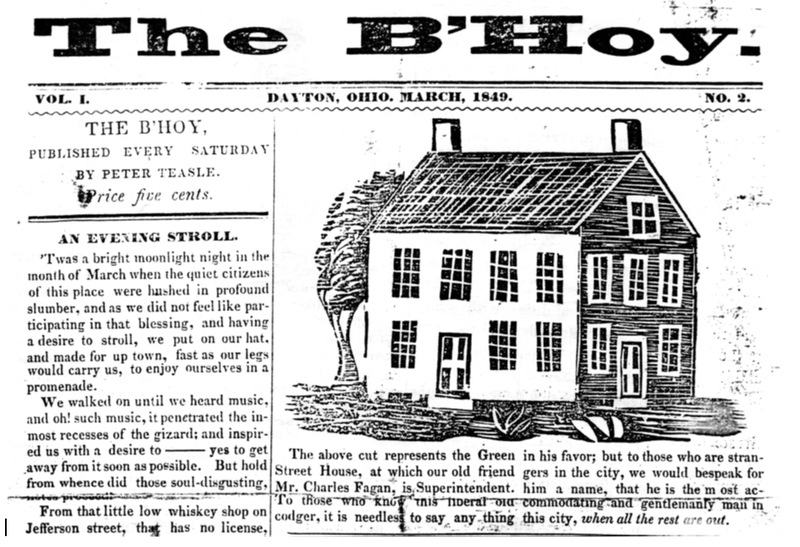 On March 7th, 1862 the Dayton Daily Journal notes Daniel passed, in Troy, Ohio, on March 5th 1862. That he was formely of Dayton, Ohio. Daniel's son Oscar B. Bickford passed on October 18th, 1865 in St. Louis, Mo. (Age 17) Daniel was the son of Nathaniel Bickford and Mary Knight-Bickford. He had a shoemaking factory in Dayton, Ohio. Daniel is buried in Woodland Cemetery. Bickford plot, Section: M.
* 1860 The encroaching development from the north, what is now the Oregon District neighborhood had been plotted and settled as far south as Seely's Basin. Main roads encompassing the area would eventually foretell the neighborhood which would continue south to Woodland Cemetery. * 1861 12th day of April: First shots fired in what would be known as the Civil War. The war between the States. It would officially last until May 9th, 1865. But, the last shot was fired on June 22nd, 1865. Little known fact about Dayton is, its citizens were not as loyal to the government as we should have been. 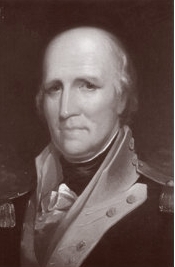 Congressman, Vallandingham, was replaced by a strong federal man, General Robert C. Schenck. Vallandingham continuing with his treasonable work was arrested and sent through the lines to the Confederate side. This did not prevent him from returning, as he went to Windsor Canada by way of the Bermuda Islands and the St Lawrence River then returning to Hamilton, Ohio. On June 15 1864 he made a speech in Hamilton and afterwards returned to Dayton to live, after being banished from it. During his absence from the country, he became the candidate for Governor of Ohio on the democratic ticket but was badly defeated by Gov Brough, a democrat running on the republican ticket. Soon after, Mr Vallandingham was arrested, a mob was formed the next night and stormed the Journal Newpaper's office, which was burned it to the ground. Major Bickham's army in Tennessee was asked to come to Dayton and take over the ruins and run a loyal paper. He came and while looking over the ruins, was approached by two men who gave him a half hour to get out of town. Instead of leaving he used his fists to settle the disagreement and the men soon disappeared. * 1862 Catherine J. Seely married Cyrus Antrim. (She becomes his second wife after the passing of his first wife, her sister Eliza. * 1862 February: Mr. Eugene J. Barney marries Miss Belle Huffman, oldest daughter of William P. Huffman. Mr. Barney is the president of Barney & Smith Manufacturing. In addition to: the Dayton Manufacturing Company, the Cooper Hydraulic Company, and is a director of the Fourth National Batik, of the Union Safe Deposit Company, the Columbia Insurance Company, the Dayton Street Railroad Company, the Wisconsin Contral Railroad Company, and the Piqua and Troy Railroad Company. The company specialized in the finest of passenger cars (Railroad cars), fitted with rich furnishings, special woodwork, art glass and elegant plumbing. * 1863 3rd day of June: The passing of Jefferson (B.) Seely. His marker notes Company H, which was Cuyahoga and Lake Counties. His records indicate he was in Company D, which was Allen and Auglaize Counties. Jefferson was most likely wounded during the Siege of Vicksburg, Miss., May 18-July 4. Assaults on Vicksburg May 19 and 22nd, and succumbed to his wounds on June 3rd of 1863. National Cemetery in Memphis, TN. Company H Section H Grave: 4661 He would have been 20 years old at the time of his death. If this is the correct Seely son of Morris and Catherine, both he and his brother David passed at the age of 20. There are 8,000 Union and Confederate Soldiers buried just in the Memphis National Cemetery, that remain, unknown. Is this the correct Jefferson Seely? Based on records, yes. But, no one can be 100% sure. Then, who is Thomas Jefferson Seely? A brother? The same person? It remains unknown, so for now, until additional information comes to light, we claim J.B. Seely as family. 1864 19th day of February: The fraternal organization and secret cocity of the Knights of Pythias is founded in Washington D.C. William M. Seely, son of Morris and Catharine Seely, was very active in this organization, as noted in his obituary. Early in the group's history, when a man was inducted into the Knights of Pythias he received a ceremonial sword. Such swords might be given to a Pythian by family members, business associates, or others as a token of esteem. In recent decades, rather than require each member to own a sword, the local chapter maintains a collection of swords for use by its members. Long, narrow swords are generally used in public during parades and drills, while short swords are used in displays. Markings on swords varied widely. Most swords were inscribed with the acronym "FCB," which stands for the Pythian motto ("Friendship, Charity, Benevolence"). The Oddfellows are one of the earliest and oldest Friendly Societies, but their early history is obscure and largely undocumented. There have been legends tracing their origins back to the exile of the Israelites in Babylon in the sixth century BC. The Oddfellows had spread to America in the late 18th century, and several unofficial lodges existed in New York City; but American Odd Fellowship is regarded as being founded in Baltimore in 1819, by Thomas Wildey. Both William M. Seely and Harry Benner, Father of Mary Lou Shahan (See Shahan Family)were members of the Odd Fellows. N.G., H.B. Hunt; V.G., Wm. M. Seely; Sec., John O'Leary; Treasure, J.H. Hunt; Chaplin. * 1866 23rd day of January: The passing of William Huffman  (Age; 97) "His funeral will take place from his late residence on Jefferson Street, Between Second and Third, on Friday the 27th, at 2:00pm. Interment Woodland Cemetary. Services by Rev. M.R. Harvey." William Huffman made out his Last Will and Testament the previous year, 1865, under the direction of his wife Lydia (prior to her passing) and son William P. Huffman. “Second Ward—Christian Herchelrode, D. C. Spinning, Pat O’Connell, John Greer, John Sprigg. “Third Ward—Oscar Barringer, Adam Pritz, Elihu Thompson, Daniel Garst, John Shank. “Fourth Ward—Isaac Haas, J. B. Keller, William Arnold, John Clingman, James Applegate, John H. Gorman. “Fifth Ward—George Lehman, William Patton, John Rouzer, Ezra Thomas, L. Butz. “Sixth Ward—Henry Miller, William Winchell, Henry Guckes, Joe Hammond. “Seventh Ward—Nicholas Aull, George Neibert. “Eighth ward—Nathan Stevens, Joseph Schute, Lewis E. Sackstader, Lawrence Butz. “Ninth Ward—Jesse Demint, David G. Brown, Benjamin Kuhns, Dr. Kemp, John Mills. “Tenth ward-Jasper Billings, Joseph O. Arnold, A. Winegartner, H. Fichenser. Occupation: Home Carpenter (John was born in Prussua (Germany) in 1835) Passed: March 23rd, 1914 Funerial was held at St. Marys Church with buriel at Calvary Cemetery. (79 years, 2 mounths, and 11 days.) John emigrated to the United States in 1848 at age 12. His first wife was Mary Hefferman in 1856. 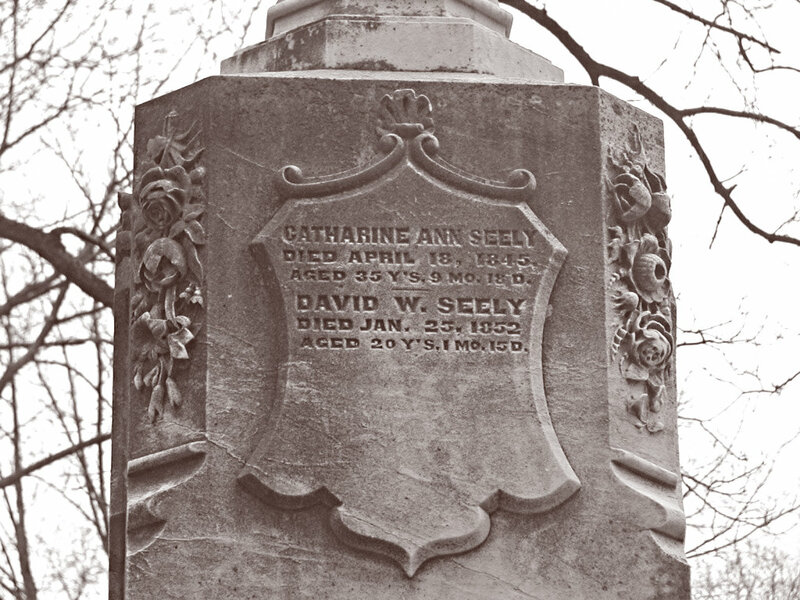 (Mary died in 1869) John's second wife was Martha J. Seely. Buried: in Calvary Cemetery, Dayton, Ohio. Sec: 13 Block: X Lot: 292. Wife: Ida D. Miller 1867-1946 she is buried in Woodland Cemetery. New Haven, Indiana. Hoyne Funeral Home. 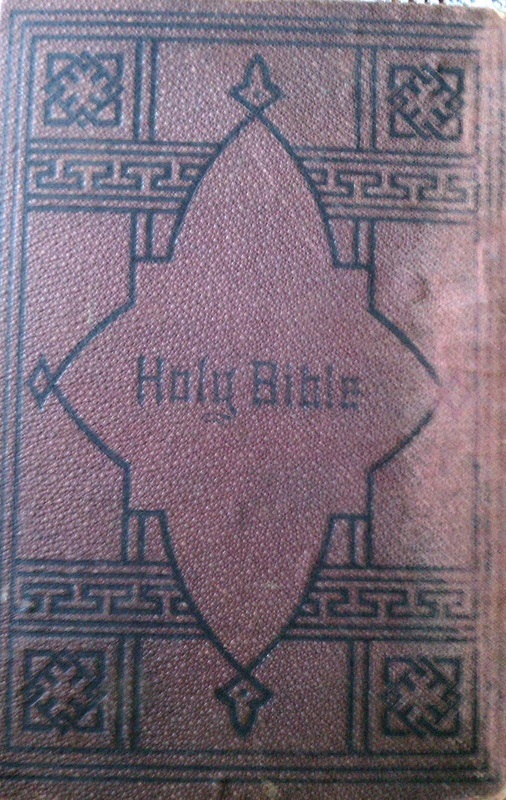 Bible given to William is incribed to: John William M. Lukey from his Aunt Anna (Seely) Crawford, 1885. * 1873 29th day of November: The new Police Station is open for business, so to speak. William M. Seely, Joseph Clegg, Harvey Conover, and William H. Gillespie are the Commissioners and driving force behind the project. 1875 Dayton, Ohio's first brick school house, built on land donated by William P. Huffman. No longer a school, it currently houses luxury apartments. Today, known as Huffman Place it is located in the heart of the huffman Historic District. * 1876 15th day of June William M. Seely passes. William fell from the rear platform of a train he was returning home to Dayton on. He passed at 9:10pm that evening. Buried in Woodland Cemetery June 17th, 1876, Age 48. (Section: 101 Lot 1351) Seely Section. * 1878: Will Lawsuit. The Plaintiffs: Lydia C. Troup (formly Lydia C. Antrim, daughter of Cyrus Antrim & Eliza Seely-Antrim) and her sister Laura B. Antrim. The Defendants were the living children of William Huffman . both deseased,) engaged in an enterprise to dig a section of the Miami-Erie Canal through what is now the central section of Dayton, Ohio. He dug a spur off the canal though property he owned, if hopes of developing an industral park. This enter-prise failed. At the time of the lawsuit, the spur known as Seely's ditch still remained. For financial reasons, Seely conveyed around twenty-five acres of this land over to his Father-in-law, William Huffman . Now, this land has was all built-up in what is known as Frenchtown, had become very valuable. It is claimed this land was made over to William in trust that it would be returned to the children of Morris and Catharine. 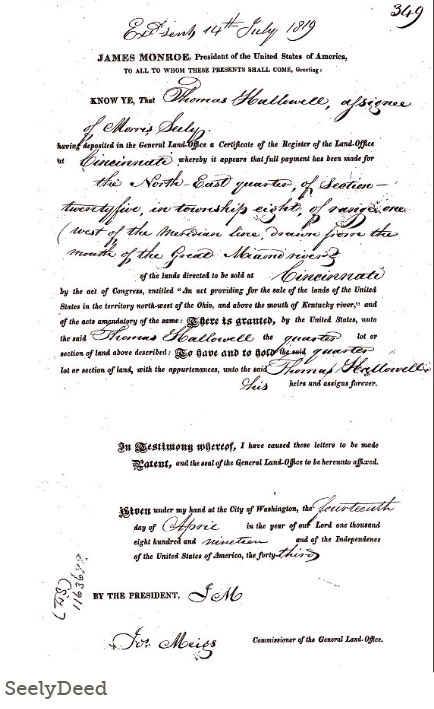 William did not honor this agreement, noting he was influenced by his wife Lydia and son William P. Huffman . An article appeared, with details of the lawsuit, in the New York Times on September 10th, 1878. William M. Lukey, Minnie Lukey, Ernest Lukey (son of Wm. & Minnie), Fred Lukey and John Henry Lukey, Jr.
* 1880 John Henry Lukey, Jr. (Martha J. Seely-Lukey's step-son / William M. Lukey's older half brother.) tears down an old structure at the north east corner of Wayne Street (Wayne Ave.) and Richard Street (641 Wayne Avenue) erecting a new building to house the Lukey Business and Apartments. A corner of this new building was occupied by the Market Saving Bank, under the presidency of Mr. Theodore Lienisch. Later the room was tenanted by the Dayton Bar Cafē and Resturant. It has been said, "Without fear of successful contradiction we can say that John Lukey conducted Wayne Avenues most popular saloon at this location which was the north-west corner of Wayne avenue and Richard street. We also say that John H. Lukey, Jr. was one of Wayne avenue’s most successful business men". In his capacity as owner and operator of one of Dayton’s most popular saloons, Mr. Lukey was a most congenial host. He knew everybody and he was liked by all. Despite the fact that he was a sober and industrious business man he enjoyed life to the utmost and he was well known to the sporting fraternity. Just prior to and after his retirement he erected the building housing store rooms and apartments at the north east corner of Wayne avenue and Richard street. This building is known as the Lukey Building and was erected primarily as a home for The Market Savings Bank of which at that time Mr. Theodore Lienisch was president. Later he erected another building on the site once housing his saloon at the north west corner of Wayne avenue and Richard street. This new building is now the permanent home of the Market Branch of the Winter’s National Bank and Trust Company. He loved horses and racing of all sorts and whenever he felt so inclined he and a group of boon companions would head for Latonia, at that time our most popular racing resort. He was not adverse to modestly play the ponies however, his saloon always remained a place of amusement and good fellowship and no form of gambling activities were permitted on the premises. He owned and drove a small sorrel pacing mare, extremely fast and stylish. With this little seven hundred pound mare hitched to a stylish highly polished runabout, John Lukey was the envy of all who saw him. Jack knew and called everybody by their first name and when driving south on Wayne avenue he invariably halted at Fifth Street where he was always greeted with boisterous acclaim. When the greetings were over he would quietly place the reins between the whip socket and the shiny dash and then he let out a vociferous ‘GIDDUP”. The little mare knew exactly what was expected of her and she would set off at racing speed and without any guidance whatsoever carry Jack to his home. Many Daytonions remember Jack Lukey and his fast little sorrel mare and heave a sigh for the good old times when things mover a bit lower. Burns Avenue bisecting Wayne avenue at the Little Market House has quite a history, little known to the general public. Originally the bed of the Mad River was banked by the steep hills on the south side of Eagle street where the Mad river crossed Wayne Avenue (at or near) Burns Avenue. It must have been some time after the close of the Civil War that the present channel bed off the Mad River was dug and the stream diverted to its new bed. The fact remains that the old channel still carried a vast amount of drainage and to take care of this they dug Seely's Ditch. This ditch originally conceived was ideated by the thought that laterals could be dug from the ditch and these laterals tied in with the canal, should carry water power to production sites who had no available power. This scheme was later dis-carded and Seely's Ditch simply carried away neighborhood drainage. * 1888 2nd day of July: He is buried at Woodland Cemetery in Dayton, Ohio. * 1888 6th day of July: Dayton Journal; The Last Rites Over the Remains of the Late William P. Huffman. The funeral of the late William P. Huffman took place yesterday afternoon at three o'clock from the old homestead, on Huffman Hill. The immediate relatives and extensive family connection, together with the many friends of the dead banker, assembled to pay their respects to the departed, made an assemblage that was too large to be accommodated at the residence, and many were obliged to listen to the service from the shaded lawn. The casket, of rich black cloth and silver trimmings, rested on a bank of floral offerings in the parlor. At the head stood large floral pieces of rare flowers, while other available portions of the room were filled with similar tributes of esteem and respect for him whose earthly remains were soon to be consigned to the grave. Rev. Lonnabury officiated. The service was short and impressive, while the address and words of sympathy to the bereaved family were touching and welcome. At the close of the service a last look was taken of the well known features, then cold in death, and the casket was closed. The pall bearers, Messrs. O. M. Gottschall, J. K. McIntire, J. R. Reynolds, Geo. W. Honk, Chas. A. Phillips, Samuel McKee, P. E. Gilbert and T. S. Babbitt bore the casket to the hearse and the funeral cortage wended its way slowly through the city to Woodland Cemetery. The crowd at Woodland Cemetery was even greater than at the family residence. The scene as the casket was lowered into the grave was one long to be remembered. * 1885 4th day of May Death came to the beloved pioneer minister, Rev. David Winters. He had lived for 83 years, and during the sixty-one year of his ministry, he had preached more than 8,000 sermons, officiated at 1,300 funerals, baptized 3,000 people, confirmed 2,400, and administered the Lord’s Supper to 22,150 communicants. He actively sup-ported Heidelberg College in Tiffin and the institution honored him with the degree of Doctor Divinity. His funeral service was held at the Ludlow Street First Reformed Church. * 1888 Torrence Huffman (Son of William P. Huffman  ) promoted to Vice-President of the old Fourth National Bank, later became President of the bank, holding that position for 30 years, until 1918 when the bank merged with the Dayton Savings and Loan. The first and only directors were and are E. J. Barney, John W. Stoddard, William E. Crume, Edward Canby, C. J. Ferneding, Torrence Huffman, Houston Lowe, W. J. Shuey, and J. B. Thresher. The first officers of the bank, were J. B. Thresher, president; Torrence Huffman, vice-president, and Ziba Crawford, cashier. 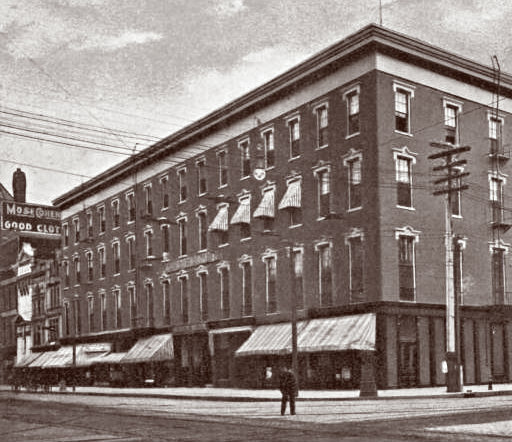 The bank was located on the northeast corner of Third and Jefferson streets, in a new four-story brick building erected for its accommodation. * 1888 Frank T. Huffman, son of the late William P. Huffman , was elected as Dayton City Treasurer. On this year, he married Ada McIntire. They had three children. * 1888 Dayton Lawn Tennis Club. Noted members: Anna M. Huffman, Emily Huffman, Mrs. Frank T. Huffman, C. H. Simms (Charles), and William A. Simms (sons of William H. and Eliza J. Huffman-Simms) Honorary members: William H. Simms, Mr. & Mrs. George P. Huffman and Mr. & Mrs. Torrence Huffman. * 1890 15th day of July: A freight train halted at Kings Mills to pick up a couple of cars loaded with giant blasting powder. “King’s Great Western Powder Works.” and nearby was a subsidiary known as The Peters Cartridge Co. From the powder made in the King mills the Peters company loaded revolver cartridges and shotgun shells. For some reason that has never been explained, the train brakes on the cars refused to hold and struck railroad cars loaded with powder. Instantly there was an explosion. When the toll could be taken of the dead it was found that 12 had perished. The name of William Franey, ill-fated brakeman headed the list, followed by: Albert Williams a cartridge maker; Samuel Stevenson and Harry Reynolds team-sters; Mrs. James Moss and her 3-year old child, Mrs. Frederick Kelly wife of the foreman of the plant and her 4-year old son, Mrs. Collins and child, the infant of a Mrs. Eliston, and a rag-picker, whose identity was never discovered. Harry Reynolds was the son-in-law of Martha Belle Huffman-Barney and E. J. Barney, who manufactured railroad passinger cars. Grandson (by marriage) to Wm. P. Huffman. * 1891 3rd day of June: John W. Aull marries Miss Mamie Harries, daughter of John Harris and Lydia Huffman-Harris. * 1892 George P. Huffman, son of the late William P. Huffman , oversees the manufacturing of the Dayton bicycle in Dayton, Ohio. Known as the Davis Sewing Machine Company. Later, Dayton Bicycle becomes Fuffman Mfg., a.k.a. Huffy Corperation. By 1905, Davis was producing 600 sewing machines and 600 bicycles on every working day. More than 2000 men and women were employed, working a six day week. manufactured the Dayton Bicycles.) 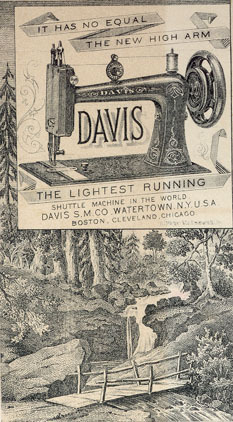 Roots of the company goes back to the Davis Sewing Machine Company, 1892. In 1899, the Dayton Special Roadster rolls onto the scene with cylindrical ball hubs, 23” tires and wood rims. In 1913, Huffman's Dayton Cushion Frame Roadster provides comfort with unique shock absorbing construction. 1936 sees steamline construction and balloon tires! On the 13th of August 2004, Huffy announced that its financial statements had accounting irregularities. The price of Huffy stock (Stock symbol: HUF) declined by 40 percent on the next NYSE trading day. as a listed stock. Finally, October 20th, 2004, Huffy announced that the Huffy Corporation and all its United States and Canadian subsidiaries would file for bankruptcy protection under Chapter 11. In 2012, Huffy targets adults in a new print campaign that reminds grown ups of the simple pleasures of riding a bike. The Huffy bicycle left Dayton, Ohio shortly thereafter as a result of the lawnmower. In its quest to even out an uneven production year, Huffy created a line of lawnmowers that were perfect for manufacturing during the winter months. This expansion meant that Huffy had outgrown the little factory and it was time to move on. Huffy’s Automotive Service Equipment division went to Delphos, Ohio. The Huffy bicycle (and the lawnmower) were sent to Celina, Ohio. Huffy bicycle production was further expanded in 1959 with a new plant in Azusa, California. Huffy Corporate stayed in Dayton. In 2004, Huffy sold its Huffy Sports division to Russell Corporation. Huffy Sports manufactures sporting goods, including the Hydra-Rib basketball systems used by the NBA. By 2006, Huffy had sold more than 100 million bicycles. Bicycles sold under the Huffy name are now made in China. 1882 George P. Huffman, owner of the Davis Sewing Machine Company, oversaw the production of the first Davis Sewing Machine bicycle, manufactured in Dayton, Ohio. 1899 The Dayton Special Roadster rolled onto the scene with cylindrical ball hubs, 23" tires, and wood rims. 1904 The Dayton Racer introduced a new look with dropped handlebars,narrow racer wood rims, 28" tires, and the "DAYTON" sprocket chain wheel. 1905 The "DAYTON" nameplate made a colorful mark worldwide. 1913 The Dayton Cushion Frame Roadster provided comfort with unique shock-absorbing construction. 1920 The Dayton LaFrance, a moto-bike styled after a motorcycle, featured braced handlebars, rear kickstand, wood rims, and 28" tires. 1925 After selling the Davis Sewing Machine Company, Horace Huffman formed the Huffman Manufacturing Company, which then produced steel bicycle rims. Also Auto related items. 1936 The HuffmanDayton Streamliner ushered in a new look and a new name. One of the first Huffman bicycles, it offered streamline construction and balloon tires. 1941 Horace Huffman, Jr., was elected Vice President and General Manager of Huffman Manufacturing. The Company celebrated a banner year, thanks to the production of lightweight bicycles. 1941 Huffman Manufacturing helped the U.S. Government in the World War II effort while also making civilian bicycles. 1949 Despite a recession, advertising helped promote the new Huffy Convertible bike and made "Huffy" a household name. The Huffy Convertible's rear training wheels with foot steps revolutionized the children's bicycle market, and was the first bicycle to use the "Huffy" nameplate. 1953 The Huffy logo was created and its image quickly became associated with quality and industry leadership. 1955 The Huffy Radio Bicycle appealed to music lovers. It provided a radio built into the tank, with the antenna and battery pack on the rear carrier. * 1892 Wright Brothers (Not Related) began repairing bicycles and opened their own shop in 1983. * 1895 Frank T. Huffman was elected treasurer of the Davis Sewing Machine Company and in 1897 became Vice-president and general manager. In 1898 he was elected to the presidency of the company, remaining in that position for a number of years. Side note: William Dennick  was born in Lebanon, Ohio, February 15, 1863, and Herman September 16, 1866, and both were educated in the public schools. At the age of eight years William began to earn his livelihood by working on a farm for four years, and then entered the employ of the Buckeye Brass foundry, of Dayton, at a compensation of $2 per week for two years, at all-roundwork. He was then apprenticed for two and a half years at the trade of brass molding, and after learning the art went to Cincinnati, and secured one of the best positions in the business, with the Lunken-heimer Brass foundry, earning at the end of six months, $3.50 per day. At the termination of a period of five years he resigned his position as foreman of the brass foundry, passed two or three months in Dayton and then went to Chicago, where, after working about two weeks in a brass foundry, he was appointed foreman, which position he held for eighteen months; he next visited Greensburg and Pittsburg, Pa., being employed about six months at his trade; next passed two weeks in Chicago, and finally returned to Dayton and started in business alone, with a capital of $65, in a small building at the corner of McLain and LaBelle streets, doing his work without an assistant. A short time thereafter he associated with himself his brother Herman, forming the firm noted at the opening of this sketch, and which is now doing the largest brass jobbing business in the state of Ohio. In their small shop 20x33 feet, these brothers, in 1895, turned out over $17,000 worth of work and consumed over 250,000 pounds of brass. In their new and more extensive plant, with their energy and skill to back them, it is not at all unreasonable to foretell a more lucrative trade in the future through an increased volume of business. William Dennick was united in marriage, September 27, 1894, with Miss Nettie (Jeannette) Clark, of Springfield, Ohio. They are members of the Baptist church and make their home at No. 440 May Street. Son: William Clark Dennick would marry Mildred Lukey. and for the two years following was employed as a coremaker. He was next employed by the Stoddard Manufacturing Company, with which he remained for six months, and then for one year and nine months, was employed in the Barney & Smith Car Works, learning the carpenter's trade. For one season he worked at outside carpenter work, then went to Cincinnati, where for nine months he attended to the smelting furnaces of the Lunkenheimer Brass foundry, and then returned to Dayton, where he was employed for nine months in the construction of the levee. After this he had charge of Wholler's Brass foundry for four years and a half, and then became associated with his brother William in the present business, as alluded to above. * 1897 August: Mrs Juana Achey Neil arrived in Dayton from Chicago, as a guest of Dr. Jefferson A. Walters and his wife at 35 East First Street home. She was the widow of another former Dayton physician. He return visit was to organize a company to manufacture "horseless carriages" giving Dayton an opportunity to be one of the first in the emerging automobile industry! Attending her meeting to rasie monies and interest were the most moneyed leaders Dayton had to offer: S.H. Carr, John W. Stoddard, Mrs. and Mrs. Robert Russell Dickey, Mrs. Edward Pease, Mrs. H.C. Graves, Torrence Huffman, Jonathan H. Winters, Thomas Legler, Henry C. Lowe, Mrs. Edward Grimes, John Harries, William P. Callahan, G.N. Bierce, Mr. and Mrs. Stephen N. Brown, H.C. Graves, John K. McIntire, Mrs. William D. Bickham and George D. Shaw. She thought that the plant of the S.N. Brown Co. could be used. "We need to raise half a million dollars to acquire all the rights to the vehicle," she said in conclusion. "Of this sum I will receive $100,000, which I will invest in stock in the company. In addition we would have to raise an extra $280,000 for working capital. This is a total of $730,000 capital stock, or $630,000 after I realize my $100,000." Alas, Mrs. Neil's plans fell through. The Dayton businessmen decided it was too risky to invest that amount of cash in such a venture. History has not recorded what became of Mrs. Neil, but opportunity knocked on the door and Henry Ford, John W. Stoddard, among others, opened it. 1898 May: David T. Keating leaves his studies at Ohio State University to serve in the Spanish-American War. He was a member of the First Ohio Volunteer American Cavalry, out of Cleveland. The following October, after being stationed in Florida, he mustered out of the military and returned to his studies at Ohio State University. He graduated in 1899 with the distinction of being the youngest member of his class. On the day of his graduation, he was elected professor of Philosophy and Psychology by the Ohio State Board of Trustees. The following year, he resigned that position to study Law there at Ohio State. John W. Stoddard and brother Henry Stoddard: Stoddard & Grimes manufactured linseed oil. As the company grew, they also manufactured varnishes. Later paints, oils, glass, etc. under the name, Stoddard Company. The company changed it's name to Lowe Brothers Company of Dayton, Ohio. In 1869, Stoddard then began the manufacture of agricultural implements in partnership with John Dodds, under the firm name of John Dodds & Co. Stoddard was also Vice President of Milburn, a Toledo, Ohio wagon manufacturer that originally built farm wagons but then evolved to produce bodies for Willys & Pope-Toledo in 1909 and then several models and styles of its own electric vehicles from 1915-1923 called the Milburn Light Electric. Milburn was sold to General Motors (GM) in 1923. In 1903, John W. Stoddard and his son Charles (1866–1921), having made a fortune in agricultural equipment, turned to making auto-mobiles. John sent his son to Europe where he toured continental auto manufacturers. In 1904, Stoddard Manufacturing Company was reincorporated as Dayton Motor Car Company and they began the manufacture of the Stoddar-Dayton Auto! 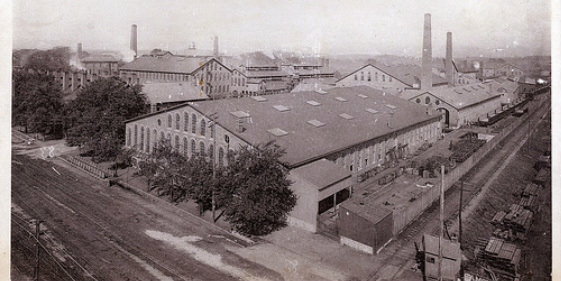 It became the second largest employer in Dayton, second only to Barney & Smith, occupying the 68,000-square-foot (6,300 m2) plant at Third and McDonough Streets that had been built for the agricultural implements forerunner in 1871. That landmark stood until 1994. Last, a Stoddard-Dayton won the first race at the Indianapolis Motor Speedway in 1909 and was the Pace Car for the first Indianapolis 500, in 1910. The Queen Anne - style Stoddard manson stood on Grafton Hill, over-looking the Great Miami River. 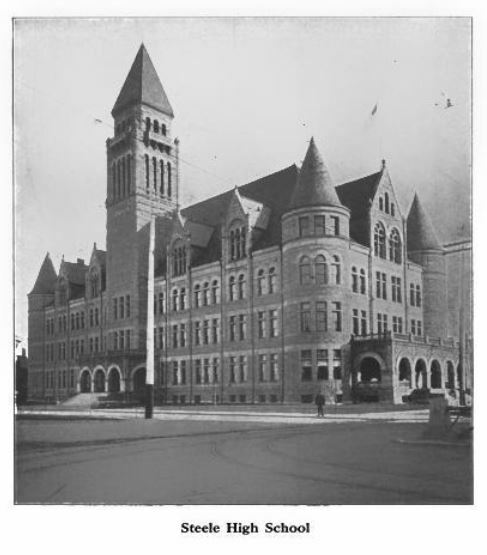 In 1926 it was torn down to make way for what is now the Dayton Masonic Temple. The Stoddard family (Parents, bothers and children) are buried at Woodland Cemetery. 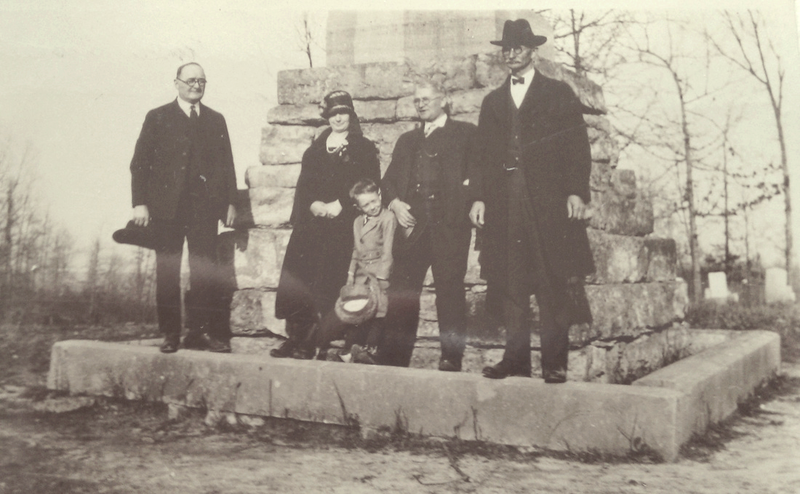 The Stoddard family has been included, as they were prominent citizens in Dayton’s history. Not related, they were intertwined with family members through business and social interactions. The Dayton Motor Company was incorporated in Dayton, Ohio. The first Stoddard-Dayton cars were delivered in 1905 and sold as 1906 models. Sales picked-up considerably after Stoddard-Dayton won that very first race held at the Indianapolis Motor Speedway in 1909. The plant was at Third and McDonough streets in Dayton and encompassed three city blocks. But, there were troubled waters ahead. 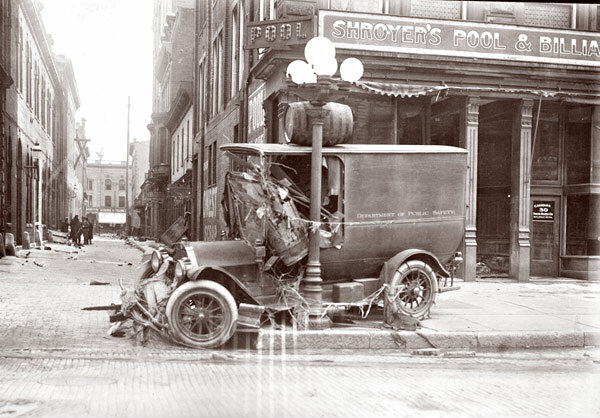 A merger with United States Motor Company 1912 was closely followed by a bankruptcy in 1913. The great flood of 1913 marked the end of a grand marquee. The assets of the Dayton Motor Car Company were purchased by the Maxwell Motor Corporation and manufacturing was moved to New Castle, IN. When Maxwell was reorganized to become part of the Chrysler Corporation, the Dayton division became Chrysler AirTemp. * 1900 11th day of September: Robert J. Lukey is born. Passed: February 20th, 1958. Buried at Woodland Cemetery on February 24th, 1958. Sec: 110 Lot: 3627 Son of William M. Lukey and Minnie Louise Beedle-Lukey. 1st Wife: Edith M. Lukey (Born: November 12th, 1900 Passes: August 16th, 1952) Buried at Woodland Cemetery. Section: 110 Lot: 3627 Edith is buried at Woodland Cemetery. 2nd Wife: Helen Develin-Lukey Born: Nov. 11th, 1907 Passed: Sept. 10th, 1984 Buried: David's Cemetery in Dayton. 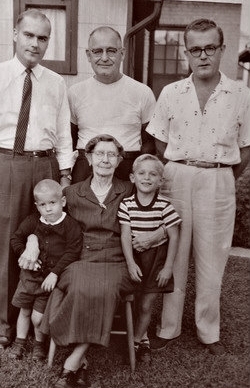 Picture left: Robert Lukey Jr., Robert Lukey Sr. and Richard Lukey. Children are sons of Robert Jr. Seated is Minnie Lukey. * 1900 The year 1900 involved some significant publications. L. Frank Baum wrote his first and most famous of books: The Wonderful Wizard of Oz. The Boer Wars by Winston Churchill and Margaret Mitchell's Gone with the Wind. Irish poet Oscar Wilde passed away in 1900. 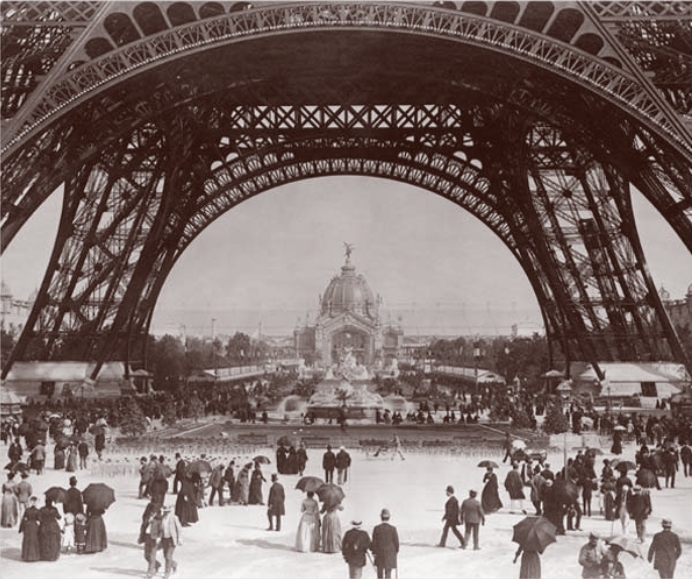 The 1900 Summer Olympics were held as part of the 1900s World's Fair, in Paris, France. No opening or closing ceremonies were held; competitions began on May 14 and ended on October 28.
end of Brown was called Old Brown but finally became Morton Ave.
Near where Morton Avenue takes off, Cline Street goes west about a hundred feet, then turns south about a square, then west again to Warren. This is caused by the Seely ditch running that way and the houses were built backing up to that open ditch. At first the street was called Zigzag Street but now it is Cline Street. * 1902-1904 Eugene J. Barney, husband of Martha Belle Huffman, (daughter of William P. Huffman) builds the Dayton Arcade, downtown. Five interconnecring buildings, topped by a glass dome. The architect was Frank Andrews, known also as architect for NCR’s factory buildings and the American Building at Third and Main in Dayton. The most notable building, which fronts on Third Street, is of Flemish design and is said to be patterned after a guild hall in Amsterdam, the Netherlands. President of the Arcade Company, Barney made sure the Arcade had the latest innovations, including elevators, a power plant and a cold storage plant. Was touted as being fire-proof when it was new. The home that the Wright brothers grew-up in. June 19, 1918, in the crash of his Airco DH.4 at Wilbur Wright Field. The Huffman field had several advantages for the Wright brothers. They could easily reach it using the Dayton, Spring-field and Urbana electric railway, which had trolleys stopping at Simms Station immediately north of the site every 30 minutes. As astute businessmen, the Wright brothers were even more impressed with the fact that Torrence Huffman allowed them free use of the land as long as they didn't let the cattle out. * 1906 5th day of January: Martha Belle Huffman-Barney Passed. Buried: Jan. 8th, 1906 Age: 65.5 She is buried at Woodland Cemetery in Dayton, Ohio. * 1906 12th day of March: The Wright brothers sent to the Aero Club of America the following list of names of reputable men who had seen one or more of their flights: E. W. Ellis, assistantcity auditor; Torrence Huffman, bank president; C. S. Billman, secretary, and W. H. Shank, treasurer of the West Side Building & Loan Association; William, Henry and Charles Webbert, in the plumbing business; Frank Hamburger, hardware dealer; Howard M. Myers, post-office employee; William Fouts and Reuben Schindler, druggists; William Weber, plumber; Bernard H. Lambers of Dayton Malleable Iron Works. Besides those living in Dayton, were: O. F. Jamieson, traveling salesman, of East Germantown, Indiana; David Beard and Amos Stauffer, of Osborn; and Theodore Waddell, of the Census Bureau of Washington. The Wrights had a list of about sixty persons who had witnessed flights. These witnesses named in the public list got requests for confirmatory letters from the Scientific American whose editor finally had decided that reports of what the Wrights had done might be worth looking into. *1907 10th day of December: Anna M. Seely-Crawford passes. She is buried at Woodland Cemetery. Crawford Section. * 1908 - 2012 Crystal Palace - 12 Valley Street (1908-12): William M. Seely  and Jessie Seely (It is unknown whom Jesse Seely is. Thomas J. Seely and Jefferson Seely records indicate, both have passed prior to this date.) owned a second-hand store on Valley in 1908. When the fad of opening motion picture theaters came to be, they quickly jumped in and started the Crystal Palace. The theater then became the Bridge (1912-13), the name probably coming from the fact that it was located near the bridge that crossed Mad River to downtown Dayton. possible that he was let go from the company after the 1913 flood. The flood accounted for a considerable amount of damage and loss to Barney & Smith, which eventually helped lead to its demise. Kinzeler also began managing the Elite theater on Troy Street the following year. Funland remained open for less than two years before it closed for the final time in 1915. Kinzeler would go on to become the proprietor of the Wyoming theater three years later. As with so many other theaters on Valley Street, as elsewhere, the building was razed a number of years ago. Nothing but grass marks the site of the old theater. * 1911 Airdome (Outdoor) Theater. An "indoor" outdoor theater, where patrons watched silent films projected onto the outside of a building. The Dayton Airdoom was located behind the Owl Drugstore (Northest corner of North Williams Street and West Third Street.) A piece of ground that was fenced off with wodden benches and chairs. A piano (and other musical instruments) would accompany the silent films. William Seely was the acting manager. (William Seely also managed the Crystal Palace Theater, as noted previously.) The Airdome was distroyed by the 1913 flood. The building it was located behind and the lot stills exists. 1912 4th day of August: Mrs. Ethel Keating-Boggess took her own life. Ethel suffered a stroke at a time when the medical profession did not know exactly what caused a stroke. She was diagnosed as having a brain disease. Ethel was married to Dr. John S. Boggess, the Chief Surgeon at the United States Marine hospital. Ethel was an accomplished pianist. The stroke affected the use of her left arm and her speech. Not being able to play the piano left her devastated and distort. She booked passage on a sleeper car to St. Louis, Mo. There she purchased a skiff for eighteen dollars and set-off down the Mississippi. Her body was found the following year on March 10th, 1913. * 1913 21st of March (Good Friday) The first of three storms arrive in the Miami Valley. Sixty degress and strong winds. The following day, skys clear until the second storm arrives, dropping the temperature into the 20s causing the ground to freeze. On March 23rd, Easter Sunday, the third storm brings even more rain! The frozen ground cannot absorb all of the water. 7:00am on March 24th, 1913 after 8-11 inches of rain, the Great Miami River reaches it's high stage for that year of 11' 6" and continues to rise. The flood marked the end of the Miami-Erie Canal system. 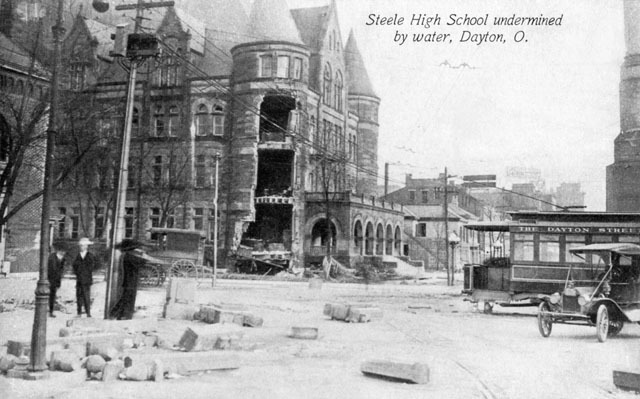 Dayton: 1913 Aftermath of the flood. Department of Safety truck washed up against a light pole. The death and distruction that remained after the flood waters reseeded. North Ludlow near Second Street after the floodwaters receded. The church on the northwest corner is the First Presbyterian Church. Gas lines exploded taking out a whole section of the city. Firemen were unable to reach the burning homes. The 1913 Flood, was a turning point. People died. Homes were destroyed. And many businesses never recovered from the destruction of the flood. The Miami-Erie Canal was all but destroyed by the flood. The canal never recovered. It was the greatest natural disaster in Ohio history. The flood was caused by a series of winter storms that hit the Miami valley. Within three days 8-11 inches of rain came down. The ground, still frozen, caused a ninety percent run-off. Dayton, founded along the Great Miami River was at the convergence of three of its tributaries, the Stillwater River, the Mad river, and the Wolf River. The rivers all converge near Dayton's central business district. When Israel Ludlow laid out the city of Dayton in 1795, local Native Indians tribes warned about the location's recurring flooding. The Ohio Governor, James M. Cox, sent out the National Guard to protect property and help in the recovery efforts. Two heroes emerged from the chaos of the flood. 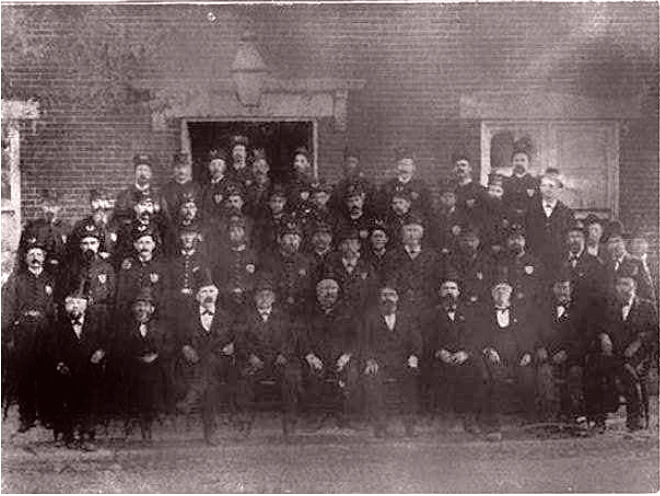 Railroad employees and National Cash Register's (NCR) President, John H. Patterson. John and his employees set-up a shelter at the NCR factory. The staff built nearly 300 flat-bottomed boats and sent out teams to rescue stranded individuals. NCR was also set-up as a make-shift hospital with a medical staff and a temporary morgue. Patterson also provided news reporters and photographers with food and lodging and access to equipment and communications. Relief supplies were issued the morning after the flood to those that needed food and supplies. As the water receded, more than 360 people had died. Nearly 65,000 people were displaced. Twenty thousand homes had been destroyed. Also nearly 1,400 horses and 2,000 additional domestic animals had also perished. Steele High School, Dayton, Ohio. Before and after the Great Flood of 1913. Built in 1894, it was repaired after the 1913 flood cause damage to the structure. Enormous and costly to maintain Dayton made the decision it close it's doors in the late 1930s. The building was demolished in the late 1940s. Located on the Southeast corner of Monument and Main Street.